Many images can be clicked to enlarge. Use the back arrow or button on your browser to return to this page. Preamble—what did Benjamin Day say about photoengraving and colour…? Did the Sunday Funnies use Ben Day from the Start? — Yes and No. All pictures should be clickable to enlarge, often twice on a PC for full size. Back button to return to text. …and the first wave of success for Ben Day dots—and Day’s less famous lines—in coloured lithographic printing from the 1880s onwards. This English penny magazine for children, for example, is from the cheaper end of the lithographic market, in 1885. 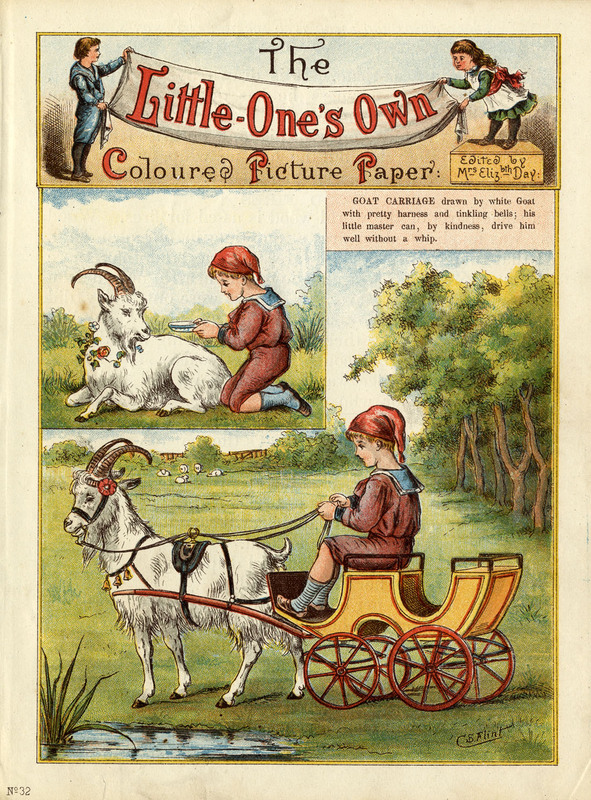 It was the first weekly paper in the U.K. to have regular colour pages, and remained a rare example. 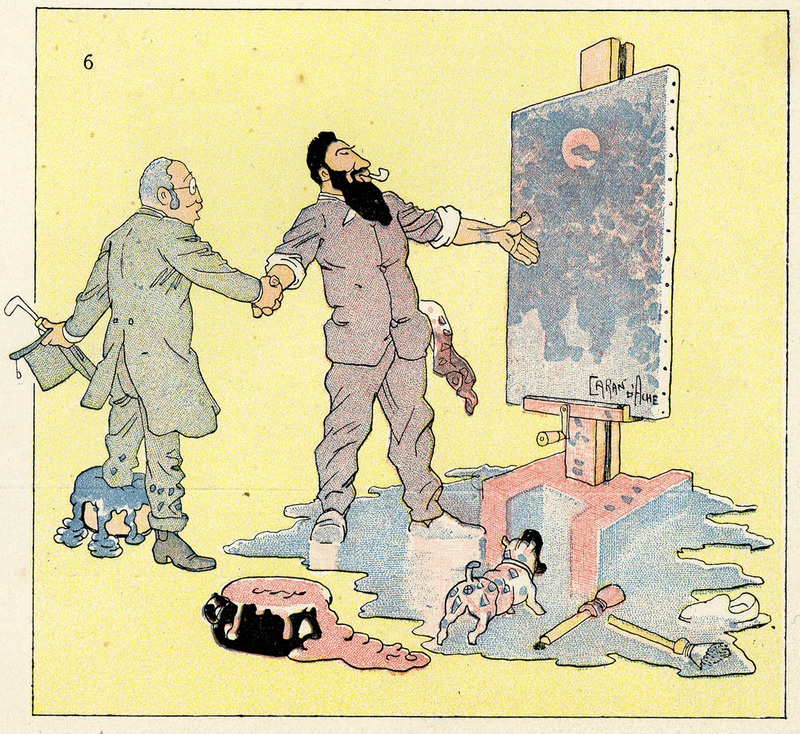 In the U.S.A. humour magazines Puck and Judge published lavish colour pages weekly, also lithographically. Now it is time to watch Ben Day and his “mechanical tints” extend their domain from lithography to new territory in letterpress printing—the kind of printing used for the text pages of most books, newspapers and magazines. During the 1880s and early 1890s, direct photo-mechanical engraving of illustrations, onto metal relief printing plates, was gradually replacing wood-engraving. This was still almost exclusively a black & white technology. Then in the 1890s, something completely new arrived in the letterpress pages of American newspapers—the weekly, usually Sunday, colour section. Very soon the Sunday section became home to another lasting innovation, later hailed as a new American art form: the comic strip. Or, to be more precise, the weekly continuing comic strip, a.k.a. the Sunday Funnies. These three details are from 1897, 1902 and 1907. Click to enlarge, and the dots should be easy to see. Not hugely different from the lithographic details shown above, are they? 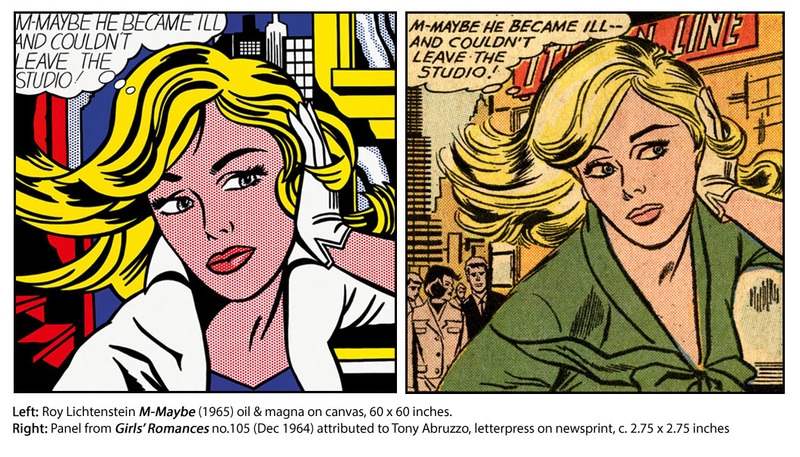 We are still a long way from the war and romance comics which directly inspired Roy Lichtenstein some 60 years later. 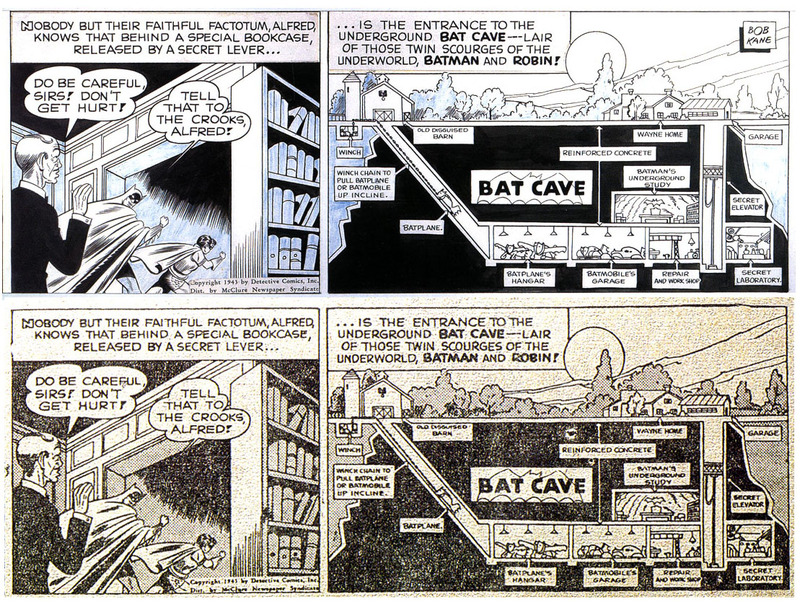 But it is a fact that the 1890s Sunday strips and the 1960s comic books were printed by very similar letterpress techniques. Printing presses advanced in many ways, but essentially used the same methods for almost a century. The amazing John Adcock at Yesterday’s Papers has reproduced a magazine article from 1940 showing the production and printing of a full page comic strip (George McManus’s Bringing Up Father). A sequence of photos shows several stages, including a Ben Day screen at work, and details of the letterpress printing process on a four-colour rotary web printing press—unmissable! I will show much more detail on the Ben Day method, as used in letterpress, below. The classic American comic book of the 60s was in pamphlet form, typically 32 pages plus covers, and about 18 x 26 cm (7 x 10 inches) in size. This format originated in the 1930s, though back then the page count was typically 64 (see Part 7—The Birth of the Comic Book). As today’s birds descended from dinosaurs, so the comic book’s early ancestors were much larger beasts. The early Sunday sections had full-sized broadsheet newspaper pages, about 41 x 56 cm (16 x 22 inches). 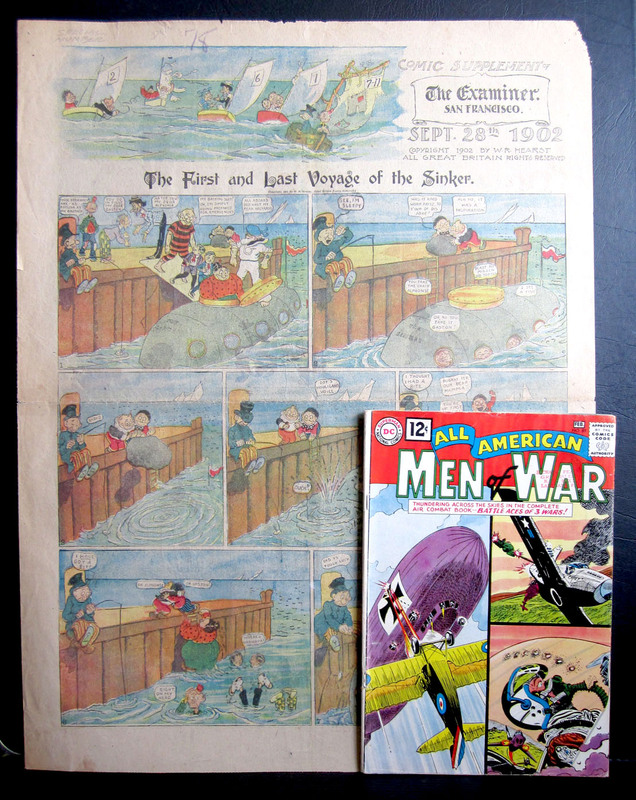 Below is a Sunday from 1902—a “jam” page by Frederick Opper, Rudolph Dirks and “Bunny” Schultze—shown with DC comics’ All American Men of War no. 89, dated February 1962. This isn’t Roy L’s copy of All American, but he certainly owned one at the time. The comic books had glossy covers which the Sunday sections lacked, but otherwise their paper, the methods used to print them, and the way their colours were created on the page were not very different. 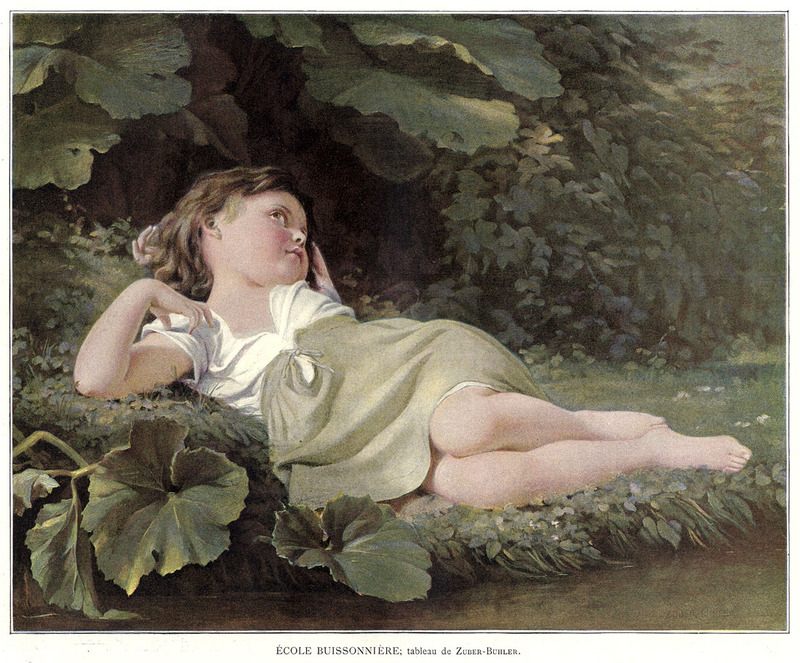 They both used colour techniques previously established by the lithographers of the 1880s—paler tints and colour mixes created using those familiar patterns of tiny dots and thin lines. And yes, the end result looked very similar to the 1885 lithographic printing shown above, though the “relief” printing of letterpress was actually quite different from the “planographic” printing of lithography. Also, increasingly, there were influences from the technology of the halftone screen—in particular, colour halftone printing, creating a full-colour image from three or four halftone-screened printing plates. The main contribution from this technology was the geometrical regularity of its dots. 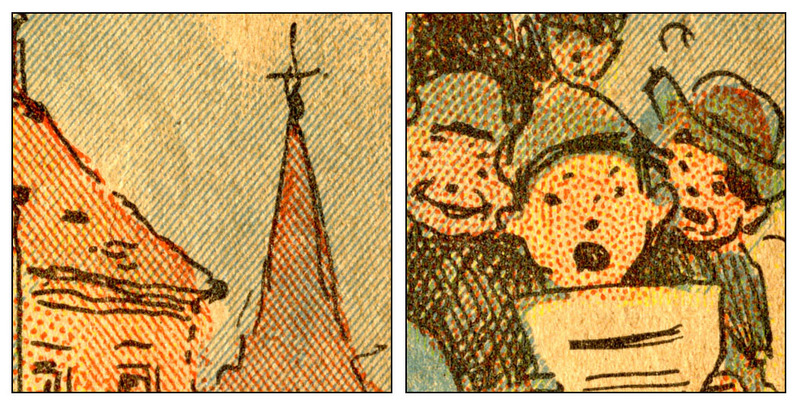 The stipples would never completely disappear from the repertoire, but in the early Sunday comics shown above, more regular dots grids can already be seen, alongside stippled dots. As for the lines… they would also stick around, but—as a future post will discuss—the U.S. comic books gave up on lines completely after a watershed moment in 1954, using only standardised, regular, dot patterns from then on—as in this 1964 example. Note that the dots are in a “square” grid. Lines of dots can be seen at 90 degrees to each other. I’ll be coming back to this, too. 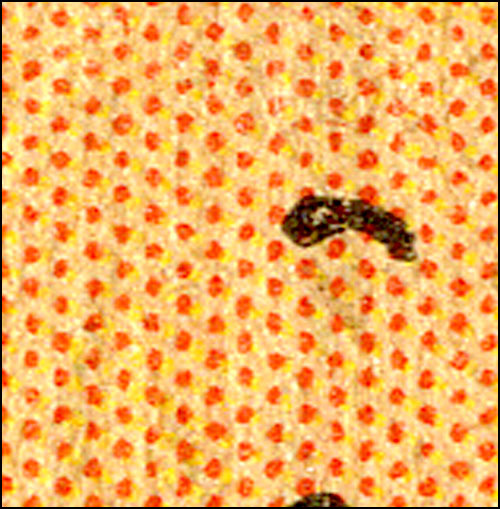 In the 1960s Roy Lichtenstein—and everyone in the comics business at the time—called these “benday dots”. 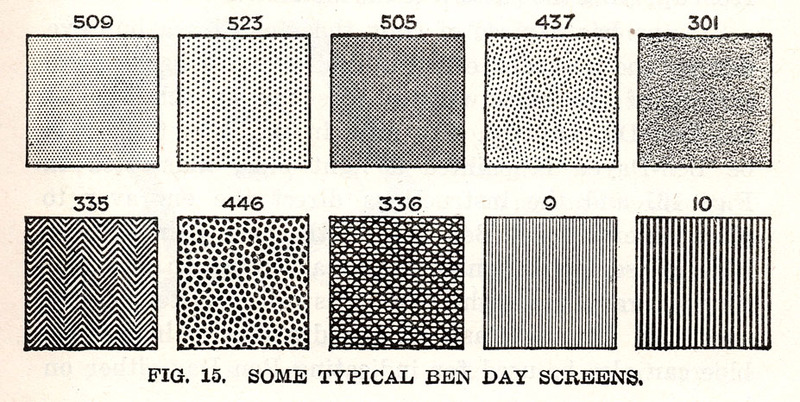 In a later post, I will chart how the true Ben Day tints of the 1890s became the “benday dots” of the 1960s—a more complicated journey than you might think—but that is a story for another day. This time I will take the story as far as the original Sunday comics. I will demonstrate in detail how a Ben Day tint was put onto a metal printing plate as part of the letterpress process—for both black & white and colour printing. But “specialist and expensive” is an odd way to talk about the process which was used to produce nearly all books, newspapers, pulp magazines and comics for hundreds of years. When I was a teenager in 1970s England, I read a daily newspaper whose ink—black only—came off on my fingers, and the New Musical Express every week, ditto. 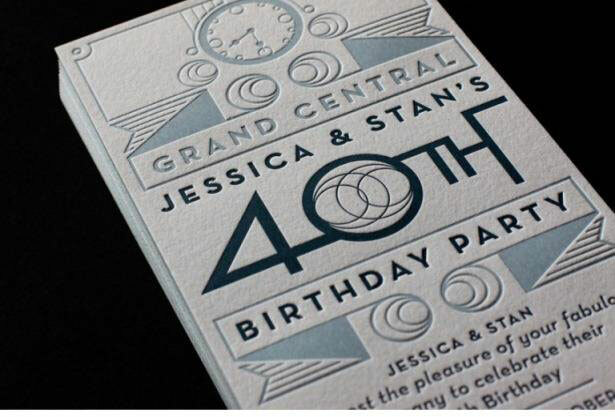 Both were printed by letterpress. Letterpress was only finally edged out by its longstanding rival, offset litho, in the 1970s and 80s. 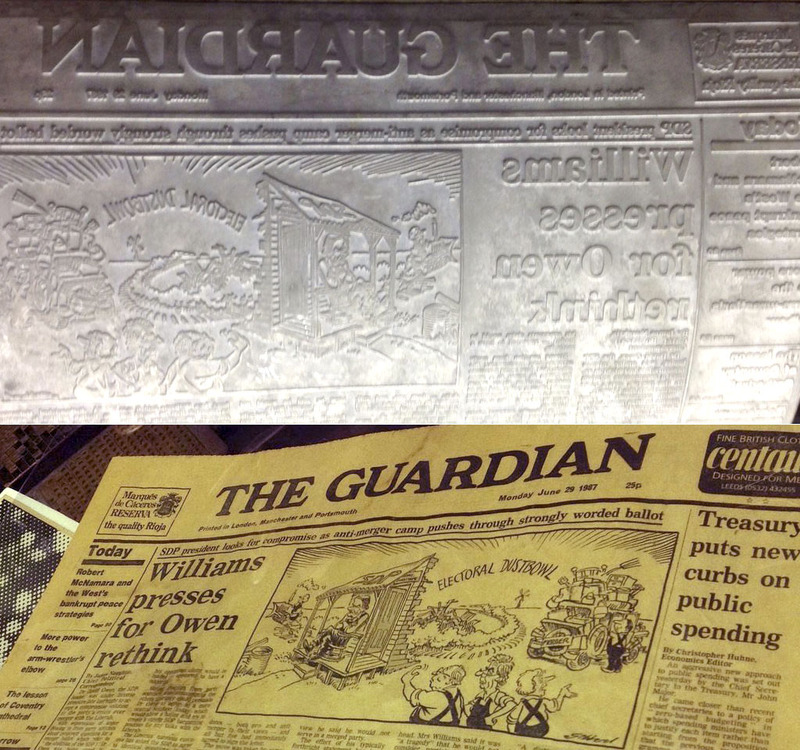 Clare Humphries took these photos, below, of what is said to be the last letterpress edition of the UK newspaper The Guardian, and its stereotype plate, at the newly reopened St Bride Foundation Library (in March 2016—http://www.sbf.org.uk/). This paper was published in June 1987, and after that it was offset litho all the way. From the 1620s to the 1980s, it had been letterpress that gave us newspapers and a lot more besides. Evidently this is, for many people, the forgotten history of letterpress printing. Letterpress was generalised and cheap for most of its lifetime—the very opposite of “specialist and expensive”! Though having fallen out of mass commercial use, by the 1990s it seems that is what it had become. The technology started around 1450 when Gutenberg used movable metal type to print books for the first time. Soon after that, the name letterpress was applied to the printing process itself. 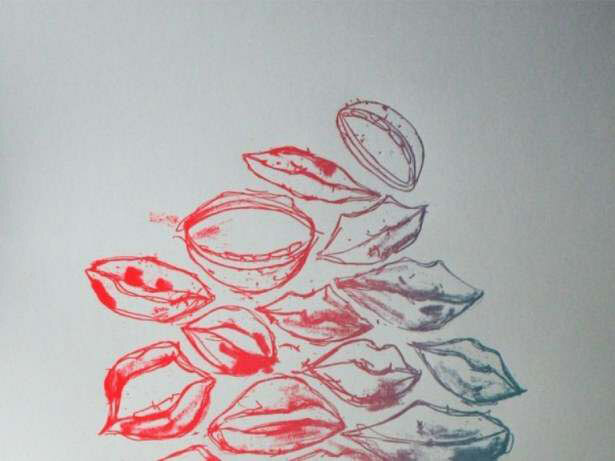 Letterpress printing uses raised printing surfaces which get inked by rollers, then print the ink onto paper. The raised areas are said to be “in relief,” standing up above the non-inked areas. and lithography with its planographic (flat) surface. The diagram below shows a lithographic stone, an engraved intaglio metal plate and a wooden relief block. In fact by 1890, very little printing was being done directly from wooden blocks. Blocks were engraved on wood, then copied in metal by stereotyping or electrotyping before printing. The next big advance in letterpress was the invention of the metal relief plate suitable for mass production printing—not a metal copy of a wood block, but a whole new thing. This is so fundamentally important that I will take a couple of brief diversions from my main narrative to discuss it. By the early 1890s, photomechanical or “process” printing had arrived in the commercial market. This was the introduction of the metal relief plate, often still called a “block,” to mass production. Previous use of metal plates in relief for illustrations had been very limited. 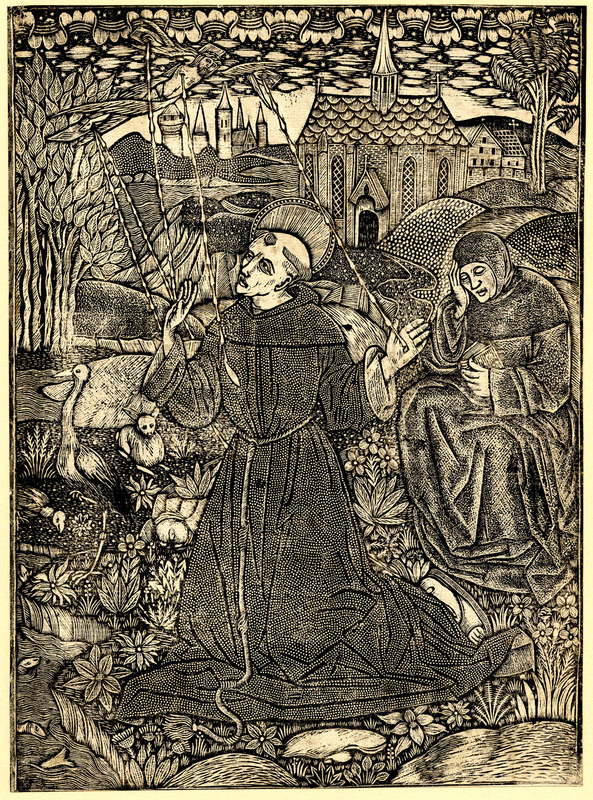 In the 1450s a short-lived trend started in Europe for metalcut religious prints—like woodcuts, but engraved on metal. Hand engraving of metal was even more laborious and slow than wood engraving. It was never an option for mass commercial printing. Elisha Kirkall tried out direct engraving of metal plates, but it was not a lasting success. Metal-engraved illustrations probably by Kirkall for Aesop’s Fables (1722) inspired Thomas Bewick‘s new art of wood engraving in the 1790s , though, so Kirkall may have had a major indirect legacy. In the 1780s, William Blake, trained as an intaglio engraver of copper plate, needed a faster cheaper way to print his own illustrations with written text, called “illuminated books”. Blake borrowed the acid etching technique from intaglio etchers, reversed it, and invented the hand-drawn, relief-etched metal plate. He could only print one at a time, by hand. His etch was too shallow to produce a large number of prints quickly. Hardly anyone else took up this highly personal method. Another Brit, Edinburgh printer W.H. Lizars—an accomplished wood engraver and lithographer—also tried out relief-etched metal plates, around 1819. Reportedly his etch was also on the shallow side, needing hand-work to deepen his grooves. He may only have done one published frontispiece in one book this way. Charles Knight, publisher of The Penny Magazine, bringer of edutainment to the masses, patented a new colour printing method in 1838. He called it “Illuminated Printing” which surely must have been a nod to Blake. Knight printed four colours one after the other onto the same sheet of paper, from four metal relief printing plates arranged on one adapted hand press. He anticipated both 4-colour printing and its “wet ink-on-wet ink” component, but his method was slow and cumbersome and could not be adapted to mass production. He soon gave up. He sold his machines and his method in 1841, to Stephen Sly, who failed to make lasting commercial headway with it. Sly illustrated a few books, and started a subscription series of prints which soon failed. His etched metal plates used solid colours only, no line or dot tints. 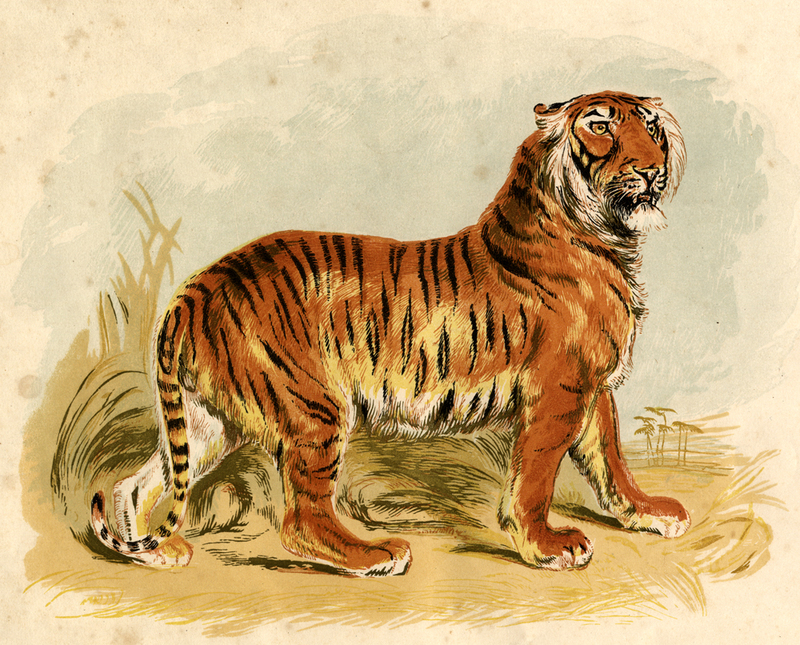 This tiger is probably his best colour work. It was the frontispiece to a Charles Knight book, The Pictorial Museum of Animated Nature, c. 1850. And yes, Sly had gone beyond the restrictive four plates / four colours. After George Baxter sold licences to use his patent method of colour printing in 1849(see Part 5-&-a-half), some of his licensees might have used engraved metal plates—rather than engraved wood blocks—for some or all of their colours, and possibly their key images. I have seen a claim that Joseph Kronheim and William Dickes used only metal plates for some of their work, but I’m not sure if this is true. William Dickes seems to have invented aquatint in relief—using the “wet” or “spirit ground” aquatint method—for his colour plates in the late 1840s (Part 5-&-a-half). This was a metal relief method, and it was successful, widely used, and lasting—but only used for colour plates. The key image in these prints was usually a black & white wood engraving. Printer George Leighton took up relief aquatint enthusiastically. It got him the job of colour printer (from 1855) and later publisher of the Illustrated London News. When The Graphic took up the same type of colour printing regularly from the 1870s, they used London-based printer Samuel Hodson. By the later 1880s, though, there is evidence that The Graphic had shifted colour printing to Paris, where the “dry” or “dust ground” relief aquatint method was now used, called resin grain chromotypography. Though many of the key plates in The Graphic‘s colour prints continued to be wood-engraved, by the late 1880s and 1890s they were also using the new photomechanical process. Dickes, Leighton and their successors put relief metal plates for colours firmly on the map. But as noted, most of their black key plates, and most black and white illustration, was still printed from wood engravings. Until Firmin and Charles Gillot. 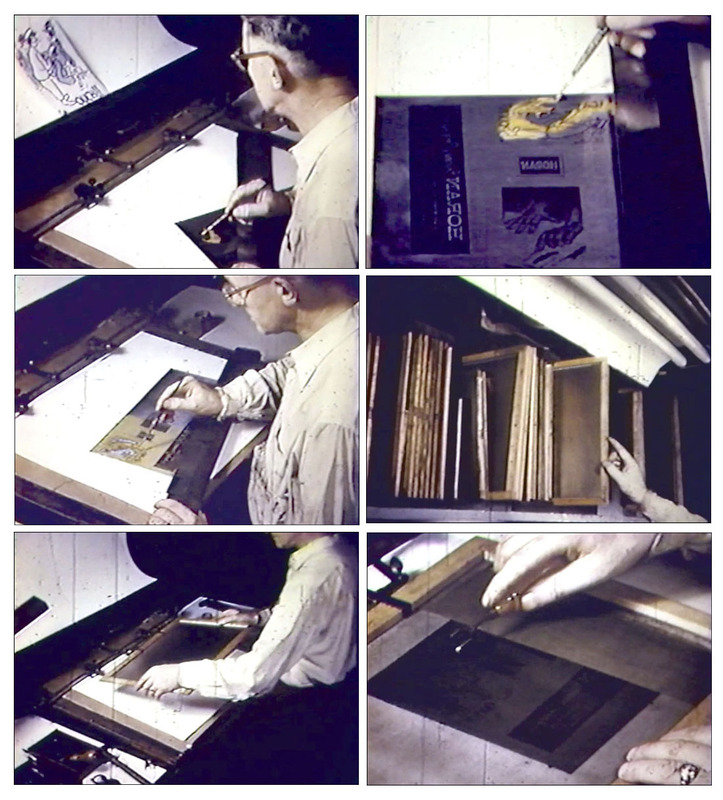 Before the photomechanical process, a photograph or drawing could be printed onto the surface of a wood block, but in order to be printed in a magazine, the wood block had to be engraved by hand—a process which took a number of days, and only indirectly reproduced an artist’s work. The original artist of a drawing had to watch other hands shape the final look of the printed picture. Now, thanks to the inventions of Firmin Gillot and his son Charles in Paris, images could be acid-etched onto a metal printing plate directly, in relief, then printed alongside text. Firmin Gillot solved the problem of getting a deep enough acid etch for this purpose. I’ll mention how he did it later, and where Charles fits in. The Gillots’ revolutionary achievements underlie all the letterpress printing of pictures in newspapers, books, magazines and comics right through until the 1980s. 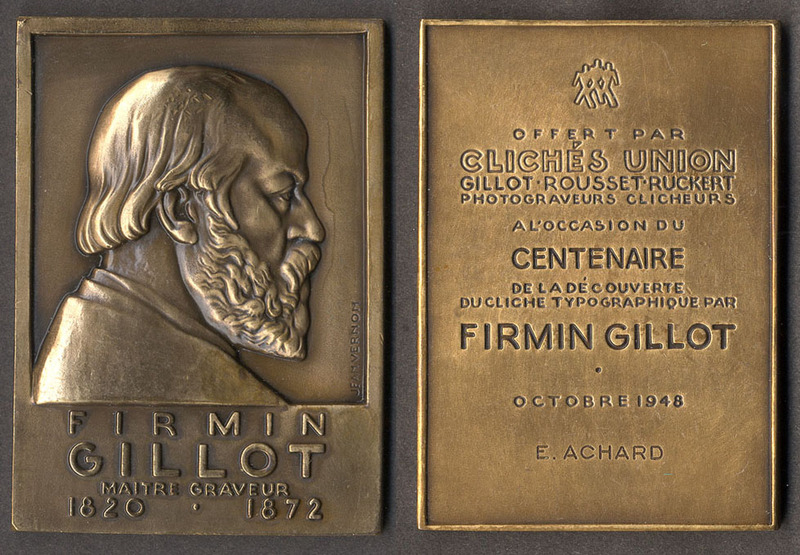 Gillot père was celebrated in 1948 with this centenary medallion, by the successor to his old company. 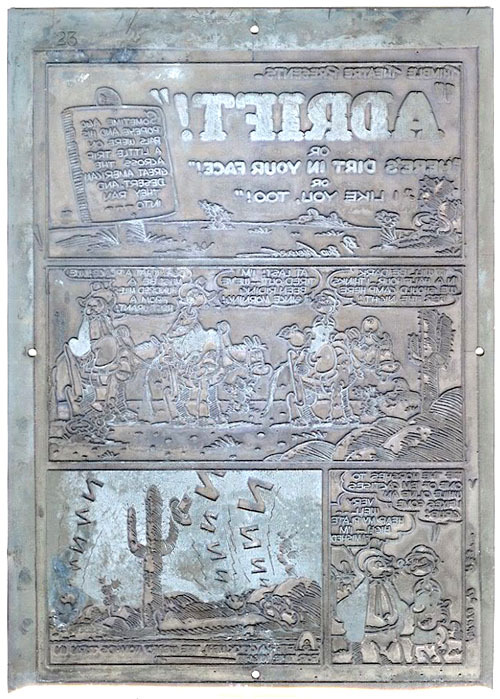 The “cliché typographique” mentioned here is essentially the etched relief metal printing plate. Firmin is not being accused of inventing a tired old trope. Medallion size 6.5 x 9 cm, 2.5 x 3.2 inches approx. Front and back shown together. Photomechanical process work very soon became known simply as “process.” The name photoengraving also stuck, and stuck for longer—despite the fact that it is in fact a photo-etching process—probably because it was replacing wood engraving. Starting with a simple example: a black & white (B&W) image of a line drawing. I’ll bring on the Ben Day dots very soon. First I’m looking at the making of a photoengraved printing plate without Ben Day, since the dots were added by the engraver during this process. Firstly then, the B&W photomechanical or “process” line block itself. In Part 4 I showed how an image is etched onto a metal plate from a photographic negative. I’m going to show this again now. 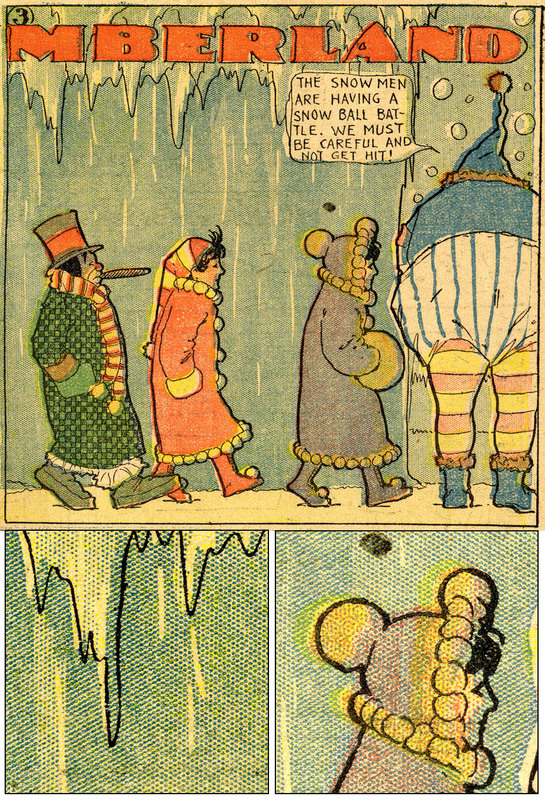 This time, I’m using a George McManus daily strip—Bringing Up Father, admittedly not from the 1890s, but from 1933—as an example. 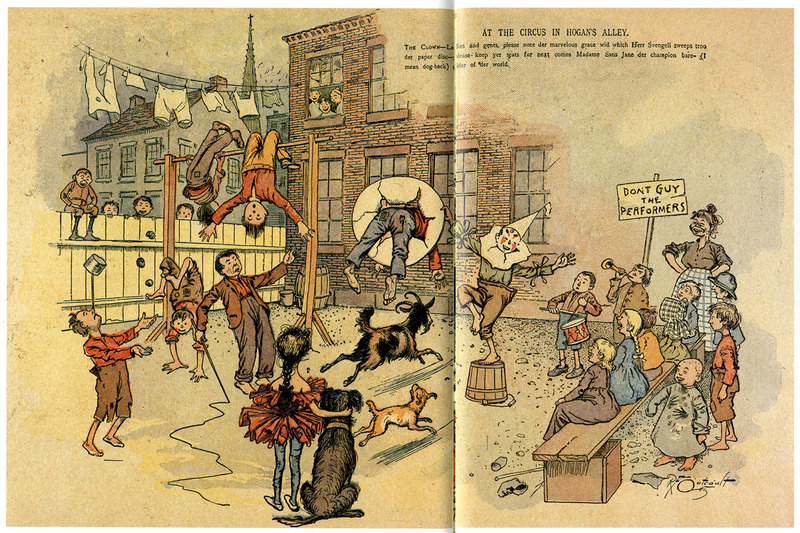 There were no daily strips in the 1890s, but similar things were being done with Ben Day on black & white illustrations. Later on, once the daily strips were established, they used a lot of Ben Day. It’s a fun way to show the process at work. This is what the original artwork looks like, after 80-plus years of yellowing over time. Note: no dots. For simplicity’s sake—and because it isn’t really that simple!—I’m going to look at the photoengraving of just one panel. In real life, the photoengraving team would do the whole strip in one go, of course. In fact they might do several strips and/or other illos, ads etc. on one large printing plate for economy, and cut it up afterwards (see Part 4). Here’s my single panel. 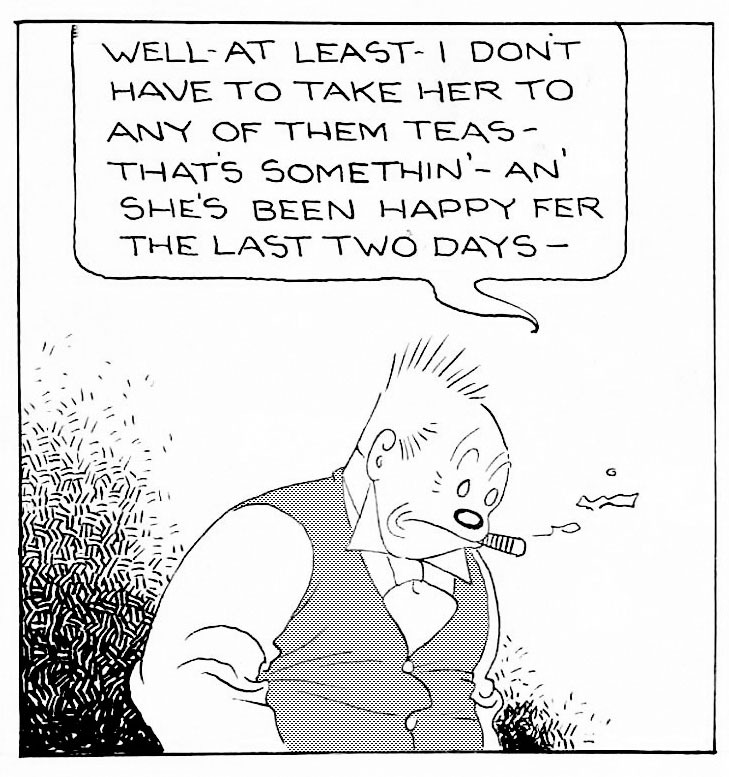 It shows Jiggs, one of the stars of this long-running strip (alongside wife Maggie). Following just this one image through the process, then: after the completed artwork has arrived at the engraving workshop, a camera operative photographs the picture—not making a positive print on photographic paper, but a negative on transparent collodion. At this stage, it is reduced in size from the larger original art to the size needed to print in the newspaper. Now, to get the image onto the metal printing plate, strong light is shone through the negative. 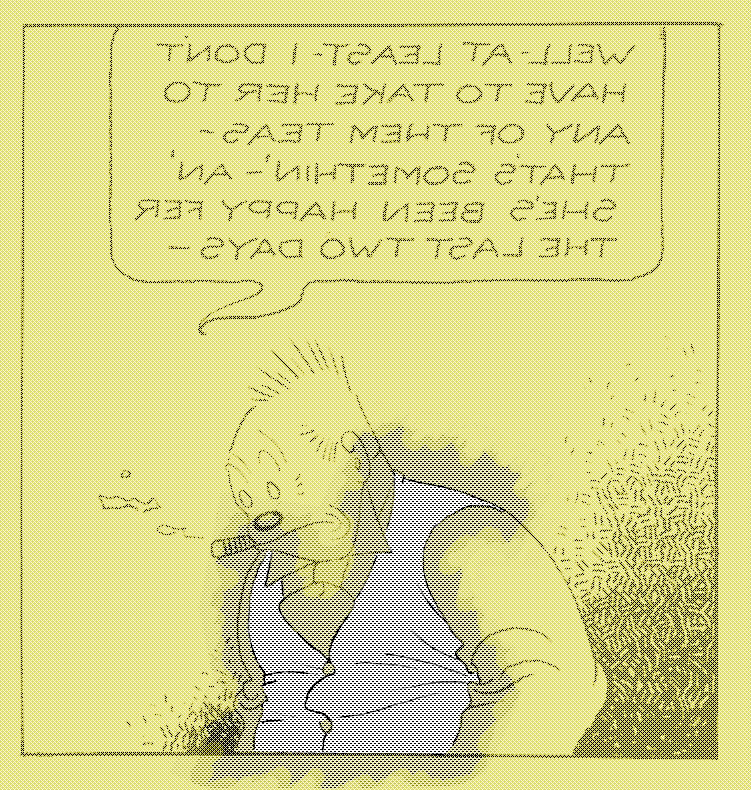 “White” areas seen on the negative above—black on the original artwork—are in fact not white but transparent. They let light through. The black areas block all light. There is a light-sensitive coating on the metal plate—generally, in the early days, a layer of bichromatized albumen (made from egg whites). Before exposure to light, this coating can be washed off the plate easily with water. Where the light hits it, the coating goes hard, will no longer dissolve in water, and sticks firmly to the metal plate. Crucially, it also becomes resistant to acid. As seen at line 4 in the diagram below, the “white” areas from the negative image—the blacks of the Jiggs picture—now exist as hardened areas of coating, firmly stuck to the metal. But this coating is not easy to see in this state, so the whole plate is now “rolled up” with special black ink from a roller. This is similar to the ink used in drawing on lithographic stones, and very different from printing ink. 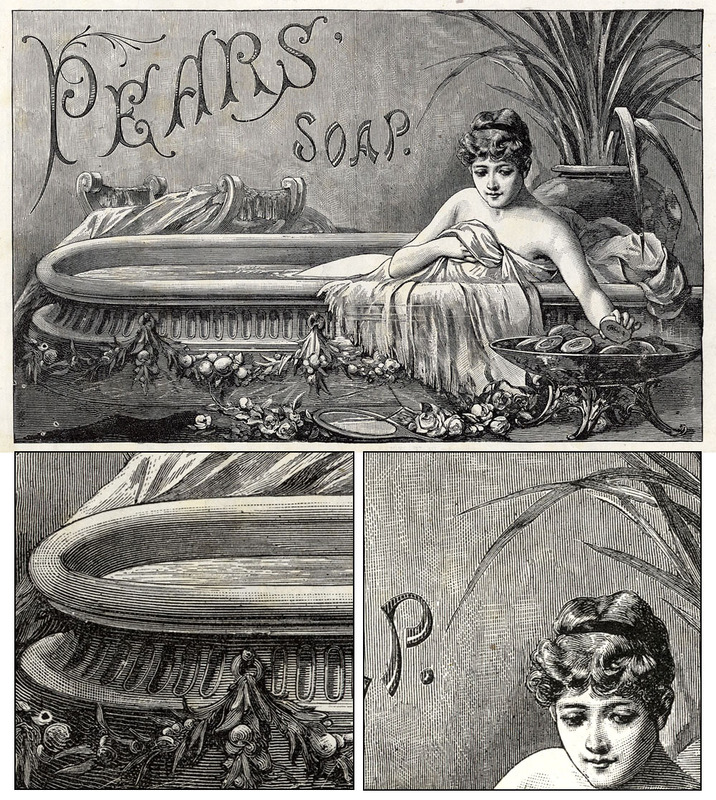 The parts of the albumen layer which have not been hardened—corresponding to the white areas of the picture—are now washed off, along with the ink which lies on those parts. The remaining, light-hardened, areas now form an “acid resist” on the metal, in the shape of the line drawing—and it’s been blackened with ink, so is clearly visible. The ink sticking to the hardened albumen also strengthens its acid-resistant properties. It is essentially flat though, and so is no use for printing multiple copies. The image needs to be brought into relief. Black lines and other black areas need to stand up from the surface, or rather the areas required to print white need to be made lower. When the metal is etched with acid, the white areas on our stained image above are eaten away. They end up lower than the surface of the metal, so won’t take any ink when the image is printed, so will print white. The black lines are acid-resistant, and remain at their original level. After etching, they are now “in relief” and will take ink from a roller, and print black. The diagram below sums this up, in a simplified cross-sectional way. Note that only the first, shallow etch is possible using the original acid-resist (line 5). A number of further etches are needed, to get the “white” areas deep enough—usually three or four. To do this, the acid-resist needs to be strengthened by brushing on, and melting into place, a powdered resin—such as the famous “dragon’s blood”(Part 4)—between etches (line 6, above). If this is not done, or not done carefully, these areas will be “undercut” by the acid, as it eats sideways into the metal as well as downwards. This process of protecting the edges of the image with resin was the genius move made by Firmin Gillot somewhere around 1848. This was how he achieved a deep enough etch for relief printing, which had not been possible before. His images were imprinted on the metal not from photographic negatives, but from transfer paper using modified lithographic ink—a process taken directly from lithography (Part 5). That took him to somewhere approximately the same as line 4, above, and he then etched the metal in much the same way. The photographic element was the genius addition of his son Charles—said to have made his first successful photo-engraved print in 1869, and to have offered a commercial service in Paris from 1876. It looks as if Firmin (1820 – 1872) lived just long enough to see photomechanical engraving get off the ground. NB: The photomechanical process may not be as time-consuming as making a wood engraving, but it still takes several hours to complete—and requires the hands of a skilled craftsperson. Thanks to Firmin and Charles Gillot, illustrators could see their work go from art board to printed paper without other hands—the wood engravers—imposing their own style on it. But, on the plus side, the wood engravers had often added a wide range of shading to their work, using lines and dots to create textures and shades of grey—as shown in my introduction. Some of these could of course be drawn by hand—and McManus or his assistant have done some linear shading in the background here—but Ben Day tinting was a very popular method of putting some grey into B&W line block work. My Photoshop version looks more like marker than coloured pencil, but you will get the idea. The blue doesn’t have to be very carefully done—it’s just a guide. The engraver will understand where the tint is wanted. But we don’t want it printed just the same. We want Jiggs’s waistcoat to have a Ben Day tint. How does the engraver do that? The engraver probably knows which Ben Day tint George McManus wants. The engraving workshop would have used a limited range of basic tints, and comics characters often had the same look almost every day. If something special was needed, or if this was a one-off job, details would be written in the borders of the artwork or attached to it. The engraver has a number of screens on a rack waiting to be used. The screen is a wooden frame with a semi-transparent sheet of gelatine & celluloid stretched on it. The underside of this sheet has the Ben Day dots (or lines) moulded onto it as tiny raised “pimples” (or ridges) in relief. 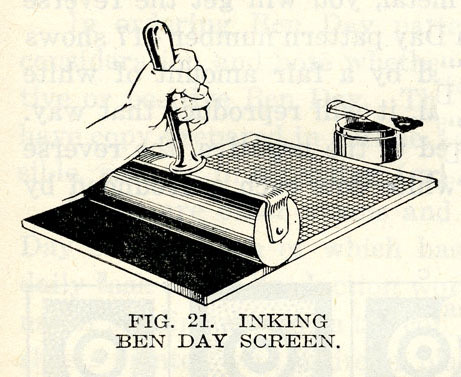 The engraver inks the underside of the screen with a roller, using a thick greasy black ink which is similar to that used by lithographers on their stones or zinc plates. Only the tops of the “pimples” get inked. The screen now has thousands of tiny dots, in wet black ink, all over it. In the picture below, on a simple job like our imagined Jiggs panel, the engraver lays the screen down on the metal plate manually. 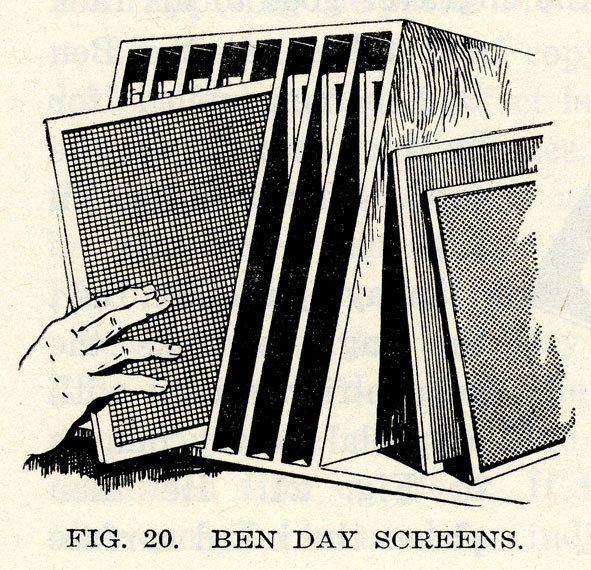 Alternatively, especially for a more complicated job, the screen could be held in an adjustable frame. Again, this is something I previously looked at in lithographic work (see Part 5). 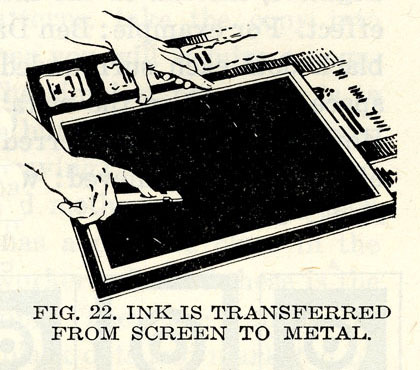 Rubbing down on the back of the screen transfers inked dots onto the metal. In real life the screen with ink on it is still partially transparent, as only the dots are black with ink. The engraver can still see the image on the metal. However, he or she does not have to be too precise in rubbing down the tint, as the areas which do not need dots have been masked off with gamboge. lots of tiny dots made of greasy black ink from the Ben Day screen, added by hand. George McManus’s artwork is ready to be printed in the newspapers*, exactly as he intended it—with added Ben Day dots. Here’s another example, and this is a real one—thanks to Les Daniels and Chip Kidd in their beautiful book Batman: The Complete History (2004). It’s credited to Bob Kane, which means that we might not know who actually drew it, but there is one person we can say certainly didn’t draw it—Bob Kane. I noted above that Ben Day tints were nearly always laid down on the printing plate, but there was one major exception to the rule. This is it: tints of black could also be placed on the white areas of the negative. 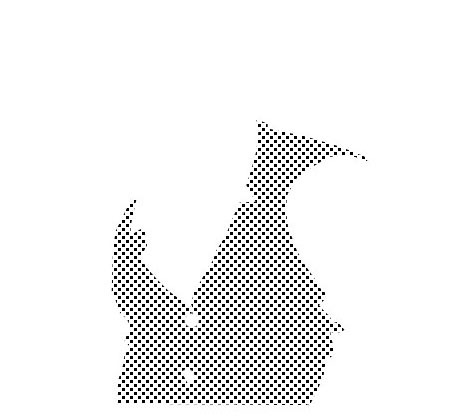 When printed, the tint would appear as a white pattern on the black area of the image. Every Ben Day tint on the photoengraver’s shelf therefore was potentially two tints. Making white dots on black like this was a common device in the preparation of newspaper and magazine small ads, in particular. Finally in this section on B&W, here’s a great film of printing plates being photoengraved in a New York engraving workshop, probably in the 1950s. The first part is about a halftone plate being made from a photograph—really interesting in its own right. Starting at about 21 minutes and 12 seconds you can watch a segment titled BENDAY about a B&W single-panel gag cartoon having Ben Day dots put onto it. If the film isn’t working here, you can see it at the original page—scroll down ’til you find The Art and Technique of Photoengraving. Lots of other good stuff to see too! Or have a look at some screenshots (click to enlarge etc.). Note this gentleman is using the adjustable frame to hold his Ben Day screen. (Or it might be a benday screen, of course.) 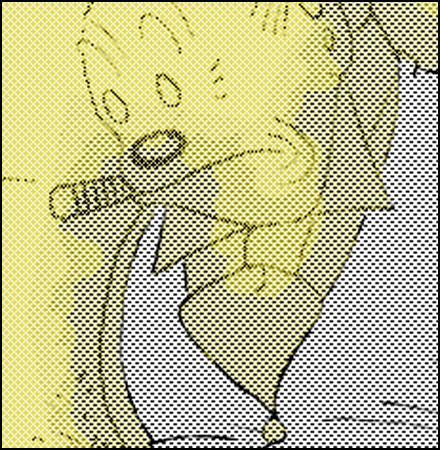 In the final panel, impossible to see clearly, he is using a small roller to press down on the screen. In a daily newspaper, comic strips would normally be printed in black on white paper, though sometimes the paper was another colour—pink or a green, for example. 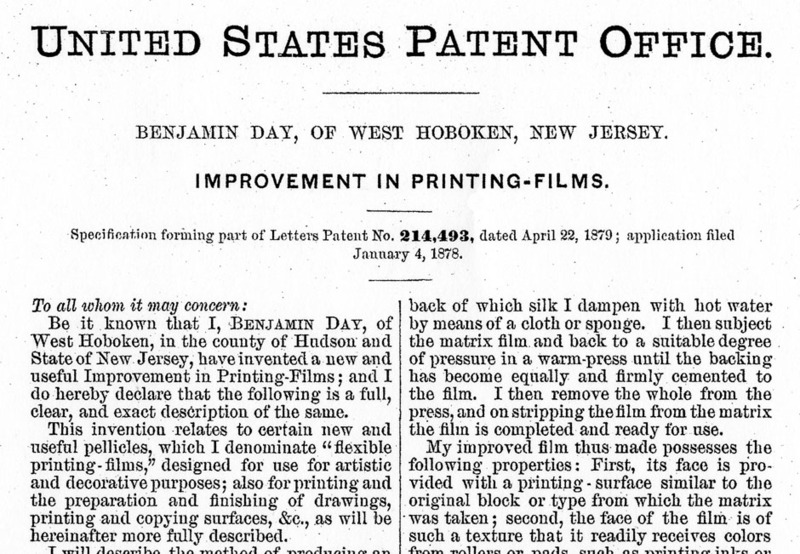 First: when he patented his new method in 1878-79, Benjamin Day Jnr was evidently aware that the world of lithographic printing was ready to make use of it (see Part 4 & Part 5). However, his patent text makes very little mention of either photoengraving or colour printing—though there are hints that he understood more than he was letting on about how his tints might be used in these fields. As mentioned, Charles Gillot had been photoengraving for French publishers since 1876—but it’s is fair to say that the use of “process” was still barely taking off in Ben Day’s launch year of 1879. For most publishers it was still not an option, and if it was, the results were far from perfect, and looked down on by many artists. WHY WEREN’T THE FRENCH THE FIRST TO DO BEN DAY IN COLOUR LETTERPRESS? — THE TINTED HALFTONE. 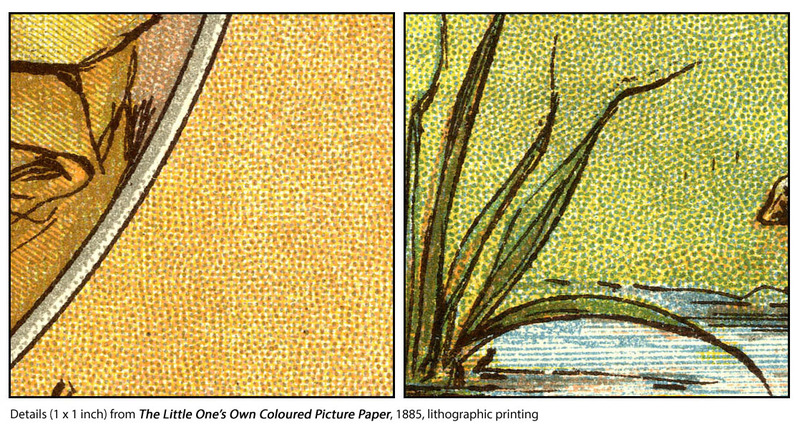 I have asserted that the cheap lithographic colour printing used for The Little-One’s Own Coloured Picture Paper in 1885 was a forerunner of later comic strip printing. In claiming this, I do not need to assume that early pioneers of Ben Day in letterpress had actually seen copies of The Little-One’s own Coloured Picture Paper. I do assume that they would have been aware of what was being achieved with cheap lithography, using a limited range of colours, and using mechanical tints (particularly Ben Day). At some point, someone somewhere realised that something very similar could be done by etching Ben Day dots onto metal relief plates, which started nothing short of a new printing revolution. For me, there are two big questions about this: why didn’t the revolution start in or shortly after 1885? Between London and Paris, all the necessary ingredients were in place. And the second question is, why didn’t it start in Paris? Why was it delayed almost ten years, until the mid-90s in New York? As discussed above, France was where the earliest breakthroughs were made in photoengraving. And, as seen in Part 5-&-a-half, early strides were made in Paris with comic strips and process line blocks in the later 1880s. British weekly The Graphic was getting a lot of its process work done in Paris, including the colour pages for its special editions—including proto-comic strips. I’ve said that process work was almost exclusively black & white at this time, but Charles Gillot and others also pioneered the use of tinted letterpress halftone illustrations. These were common in the colour pages of French magazines years before the Sunday sections arrived in the U.S.A., and even more years before actual full colour mass printing of halftones was possible. 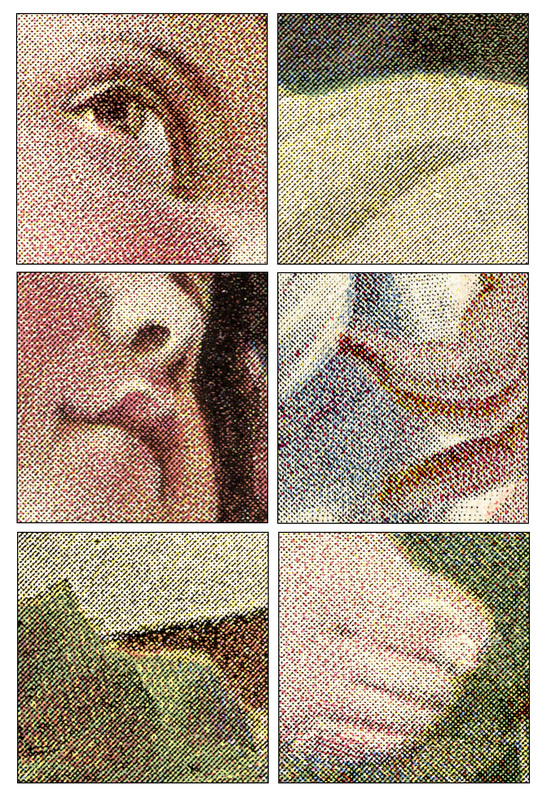 In the tinted halftone a black halftone key plate was made, often photographed from a painting. Paintings were good photographic subjects—they tended to stay pretty still. Things that moved around, like people, were still a problem—cameras needed long exposures to make their negatives. The era of the “snapshot” was still a long way off. The B&W halftone image did most of the work in a tinted halftone, with a number of other relief metal plates adding colour. Colour tints may have been done with the resin grain / relief aquatint process described in part 5-&-a-half, or were often drawn by hand. This involved a lot of hand-stippling / line-drawing. The lithographers of Britain and the U.S. had substituted the much faster Ben Day tints for much of that hand work. And Ben Day would have been faster than resin grain, too. The tinted halftone process was not unlike the production of a chromolithograph. (Indeed, by this time the technology existed to do the same thing lithographically.) Many chromolithographers must have moved over to letterpress work, or passed their skills on to those who did it. Why were Ben Day dots not part of that legacy? 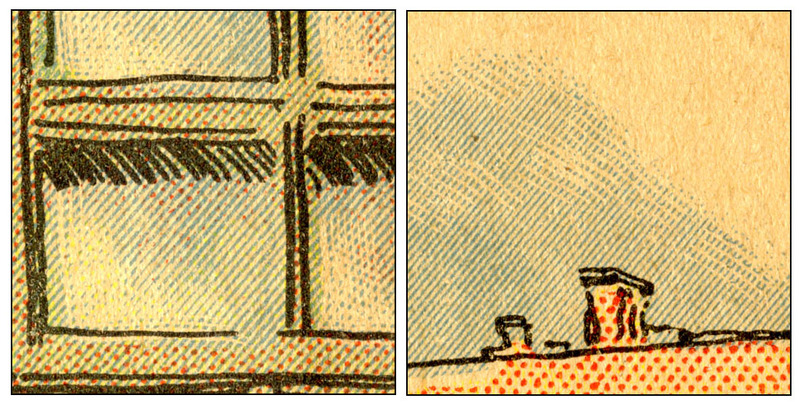 Let’s look at a tinted halftone illustration in detail. Paris Illustré was a weekly magazine, each page 30 x 41 cm in size, 12 x 16 inches—about A3 or tabloid newspaper size—half the size of a broadsheet page like those of the early Sunday sections. It had a colour cover and two interior pages in colour—every week. As noted last time, Charles Gillot had been the “directeur” of this paper. no flesh-coloured ink, but magenta and yellow used for the skin. This also points the way forward. Many printers, before and after 1890, cut costs by using no green ink, but as noted before, flesh-coloured ink for faces and hands was more difficult to let go of. This is not hard to understand—faces in particular are such focal points in a picture. Artists and publishers would want them to look good. These guys were confident they could do without it. But these French colourists / engravers, at the forefront of colour printing technology, did not yet make the leap of adding Ben Day tints to their repertoire. As previously discussed (Part 5-&-a-half) there is evidence that French lithographers avoided Ben Day tints in favour of hand stippling—and this may also have applied to letterpress. It is assumed that this was on aesthetic grounds. Or below, as made by me. In my examples, I have tried to show what can happen if you print blue and black dots of the same pattern over each other—but the registration slips in a fairly “real-life” fashion. 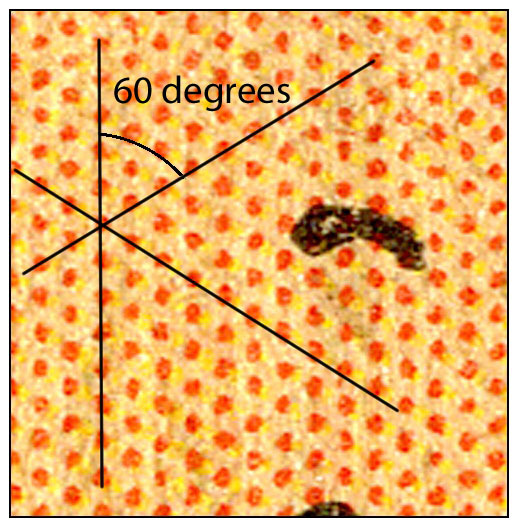 One the left, by the width of one line of dots (one tenth of an inch at original size)—on the right, by an angle of 2 degrees. I hope you can see banding—vertical lines—on the left, and a Moiré pattern on the right. Hand drawing of dots was one way of avoiding this effect, but in the long run it was not going to survive. Printers had to find other ways to overcome—or minimise—these problems, especially once they were printing 3- and 4-colour halftone images. And they did, as we will see another time. 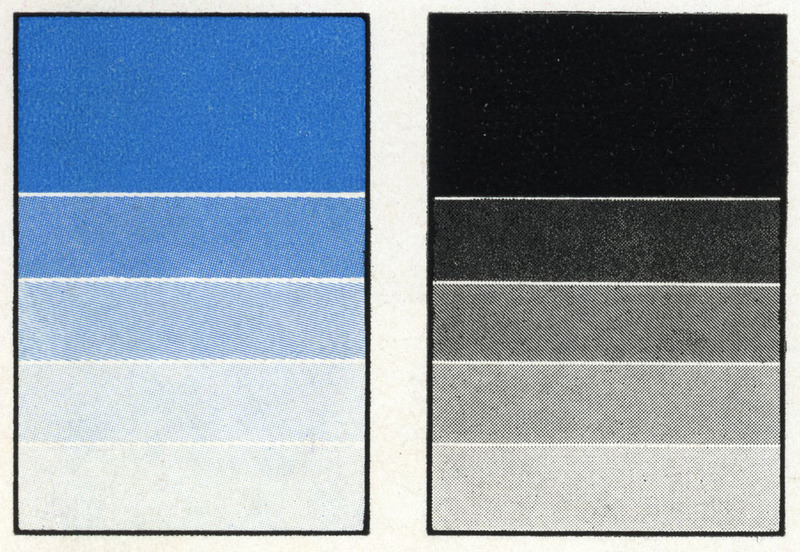 The French of the 1880s could have used Ben Day tints for their comic strips, where there were no black halftones to produce the unwanted patterns seen above. Similar Moiré effects could still happen with overlapping coloured dots on coloured dots, though, not just colours on black. Nonetheless, British and American lithographers had been overlapping coloured Ben Day dots for some years. As we saw in the Little-One’s Own, 1885, they could get good results from this fast, cheap method. 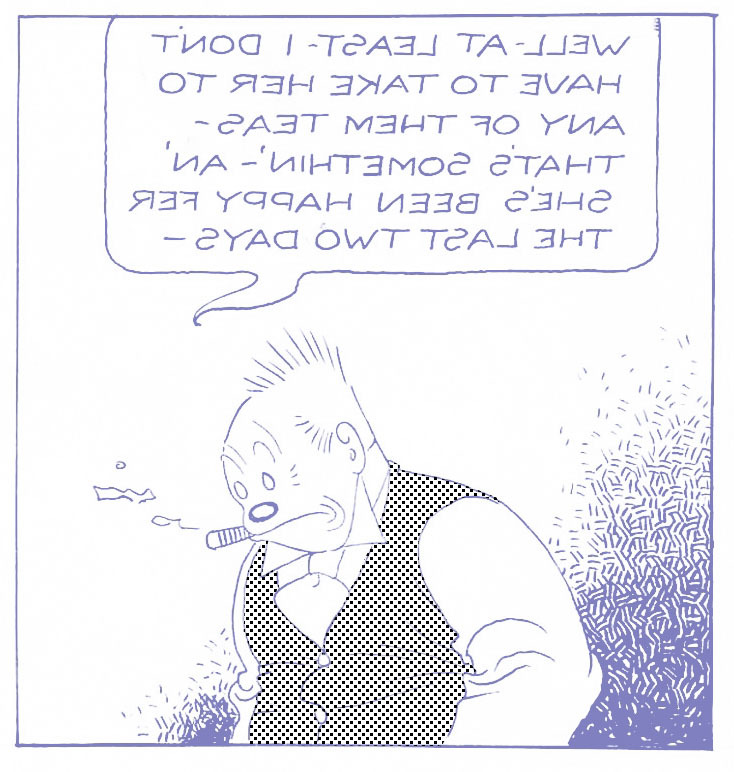 But, as we saw in part 5-&-a-half, for whatever reasons, the French also avoided Ben Day tints in their comics. 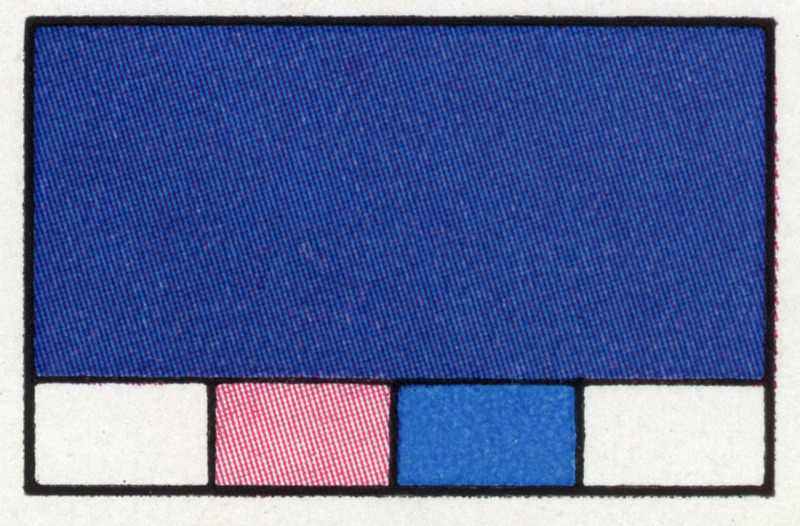 This panel from a strip by Caran D’Ache (1888) uses hand-drawn red and blue tints, with yellow and flesh supplied by the resin grain method. The transferred tint method is the next thing which delayed the arrival of Ben Day into letterpress colour. From 1890 Paris was the first city to have a major daily newspaper, Le Petit Journal, with a weekly colour supplement—printed by letterpress on newsprint, on a brand new type of printing press—publisher / engineer Hippolyte Marinoni‘s revolutionary colour newsprint rotary press. Marinoni is the third Parisian hero of this post—like the Gillots, largely forgotten today. He previously made the first successful steam-powered lithographic cylinder press in about 1869, but Richard Hoe bought the U.S. licence and rebranded it as a Hoe Press. Hoe got all the credit for that advance. Marinoni and his son-in-law also made the first press capable of printing four colours on newsprint in one press run, which made possible the coloured Sunday supplement—which gave us the comics. Also, it defined the early Sunday supplements as a four-colour phenomenon. 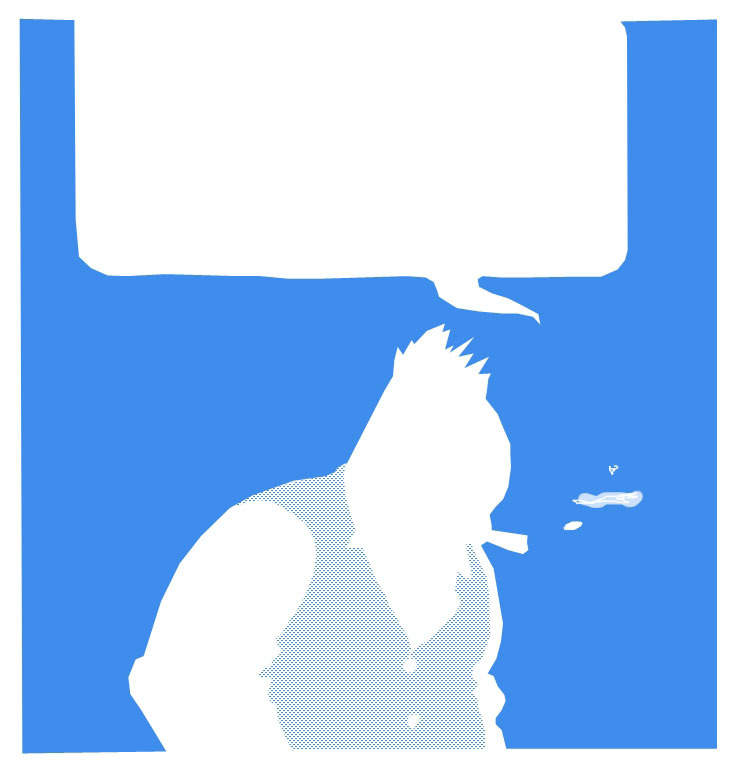 But, importantly for my story, Marinoni’s Petit Journal colour pages didn’t use Ben Day tints. They didn’t use hand tinting or resin grain either, but a different method which I will look at in detail another time—chromotypography by transferred tints. L.P. Clerc, a French printer himself, in the Ilford Manual of Process Work, 1926, says that the resin grain method “is not very adaptable to high speed rotary printing such as is used for the colour supplements of several daily papers.” So Le Petit Journal, faced with an entirely new way of printing, perhaps had a choice between Ben Day tints and this other method. Transferred tint chromotypography used transfer paper to take up inked patterns—mainly lines—from engraved copper sheets, and transfer the inked pattern to the printing plate. I described essentially the same process, as used in lithography, in part 5. As I said then, Ben Day was faster than this method, had other advantages, and largely supplanted it in lithography. Why did Le Petit Journal‘s engravers choose the less advanced technique? Perhaps it was simply that longstanding French distrust of Ben Day—which also meant that the relevant expertise just wasn’t there in Paris. Parisian printers may have been comfortable with transfer paper methods, having perhaps used Firmin Gillot’s original Gillotage since the 1850s. Marinoni’s team probably knew the tint transfer method from other work they had done. Quite possibly it was also cheaper than Ben Day. Whatever their reasons, Le Petit Journal‘s choice seems to have influenced other early adopters of newsprint letterpress colour printing—in Britain and the U.S.A.. In London, George Newnes, of Strand magazine fame, bought two Marinoni colour presses, and printed a new weekly called The Million on them (1892 to 1894). The front cover of its first issue is the only page of The Million where I have seen Ben Day tints. For most its run The Million didn’t use Ben Day, but transferred tints. It seems that Newnes and his team followed the established French model—though they may have tried out Ben Day, and not liked it. The Inter Ocean used presses modelled closely after the French type. Proprietor H. H. Kohlsaat apparently tried to import a Marinoni press, but ran afoul of some U.S. patent laws. He had his engineer Walter Scott build a close copy. You can guess what’s coming… no Ben Day tints in the Inter Ocean ! They also did it the French way. 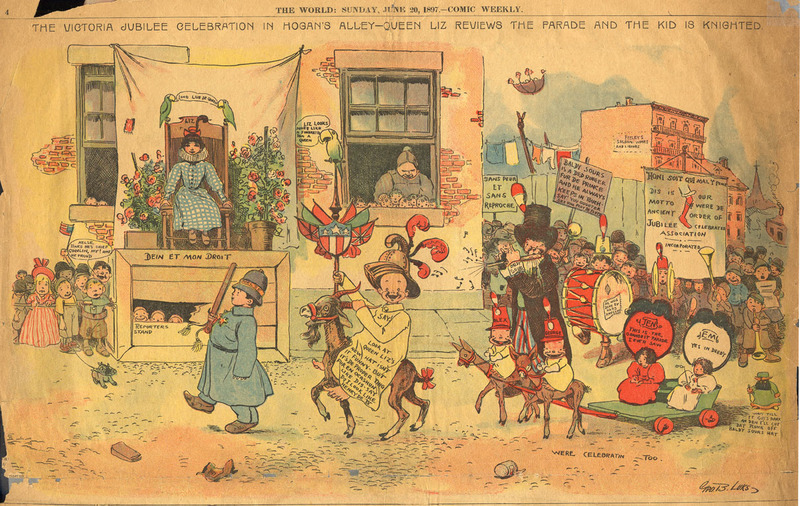 It was left to the New York Sunday sections—the Herald, the World and The Journal—to pioneer Ben Day in colour, possibly from 1893, possibly a little later. And here, in basic form, is how they did it. But this is not what I need. No doubt you have spotted the problem already. I only need the waistcoat in blue. The rest of Jiggs, even the outline of his waistcoat, just needs to be on the black plate. If we printed four colours lik this, each with its own complete version of the black outlines, the alignment of the four printing plates—the registration—would have to be absolutely perfect to avoid an awful mess. 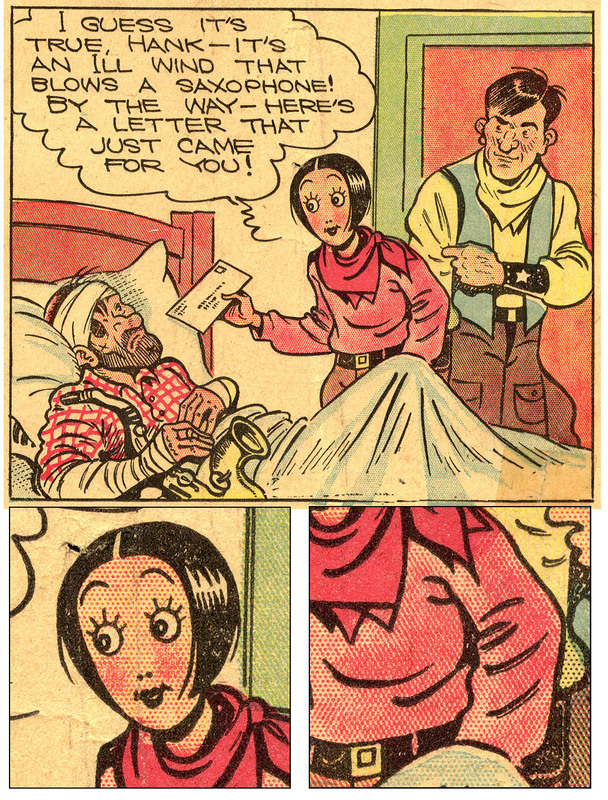 And when did you ever see a comic strip printed with perfect registration? The answer is: I make a plate that has the B&W image only stained onto it, not actually present as an acid resist. The image exists as parts of the albumen layer, hardened by light to make an acid resist, no longer soluble in water. and one that will not end up on the final printing plate. I have read various accounts of how this “stain” was made. There seem to have been different methods in use at different times and places. The account below is taken from the Pictured Encyclopedia of the World’s Greatest Newspaper, published by the Chicago Tribune in 1928—though I’ve rewritten it a little for clarity. I believe it explains pretty much what would have been done in the early days of colour comics. The usual method protects [from the acid etch] all the lines originally photographed; and if these lines remained protected on the plate being worked up for color, they would appear on the finished plates, printing in colored inks what should be printed only in black. The metal that was underlying the acid resist remains shiny and silvery, and shows in strong contrast to the “frosted” parts, giving a good guide to the operator in applying his tints; but since the metal is exposed all over, it will etch all over, except where the Ben Day tints are applied. Thus the plate will print its color only where the Ben Day shading has been applied, and will not duplicate the lines of the black key plate. L.P. Clerc again, in his 1926 Ilford Manual of Process Work, describes a method of blackening the surface of the zinc plate all over with a chemical called oxychloride of antimony—before exposing it to light under the negative. 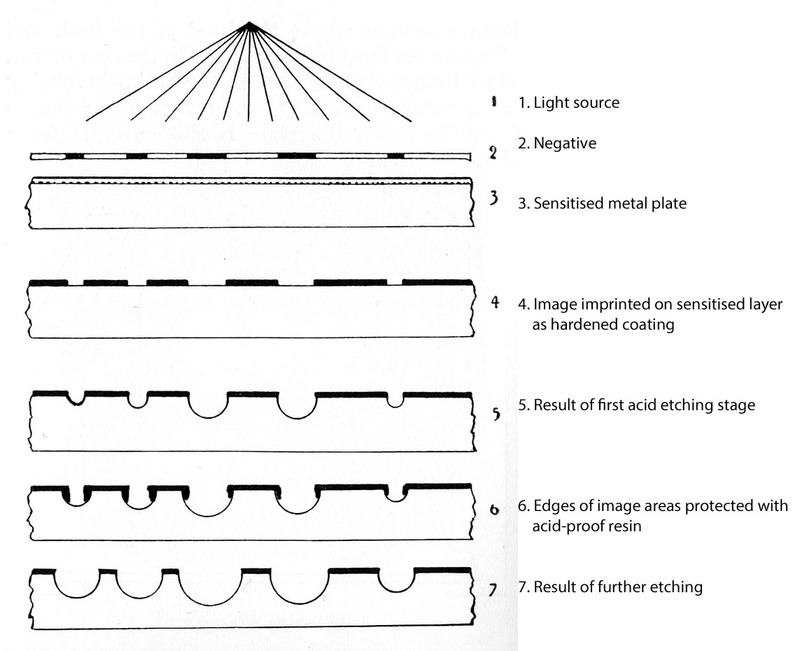 Once the light-sensitive coating has been hardened, the black antimoniated coating is removed from the “white” areas by immersing the plate briefly in weak acid. After washing off the acid resist, the image is left on the plate in black. Clerc calls this a “set-off” rather than a “stain.” It’s clearly a very similar process, but creates a blackened rather than a silvered image. Anyway, we can accept that some version of this process was done back in the 1890s, and in 1933 when George McManus drew Jiggs, and in 1943 when “Bob Kane” (*chortle*) drew Batman. And, crucially, the stained silvery image (shown as purple) is not acid-resistant. It will be removed in the etching process—the metal in the purple areas above will be eaten away, etched down along with the “whites”. Only the Ben Day dots are acid resists, and they will be etched on in relief, as I wish. And we are starting to see how the magic is done. What about the other colours? If we are doing four-colour comics (see Part 3) we still need yellow and red. If I was colouring this panel fully, in addition to my black and blue plates, I would need to make another plate for my red dots/lines/solid colour, and a fourth plate for my yellows. Jiggs’s face would probably have red dots on it to make a pink. That blue background I made above might also have red dots (or lines) on it, to make a purplish blue. Or it might have solid yellow in addition to the solid blue, making dark green. Equally, Jiggs’s waistcoat could become a pale purple, by adding red dots to the red plate, and printing them with my blue dots. Or it could be a lime green, if I added solid yellow to it on the yellow plate. Whichever of these I chose, the blue printing plate would be made just as I have shown above. Only the red or yellow plates would be different. This is a very simple introduction to the idea of colour separation. I have written a bit about this before in the context of lithographic colour printing. During the printing process, the full-colour image has to be built up from just four colours. (In lithography there were typically nine or more). In making the printing plates, the colour separator must do the opposite—either mentally or with the help of sketches, break down the colour picture into its component blue, red and yellow parts. The tints shown here are much finer than those used in the comics. The chart was printed on glossy paper, not newsprint. Newsprint could only take coarse tint screens, perhaps 55 or 65 dots per inch. The Standard Company was showing off what it could offer clients in glossy magazine advertising, maybe using up to 200 dpi. Hence the statement that they used copper plates—more expensive than zinc, and used for finer detail. 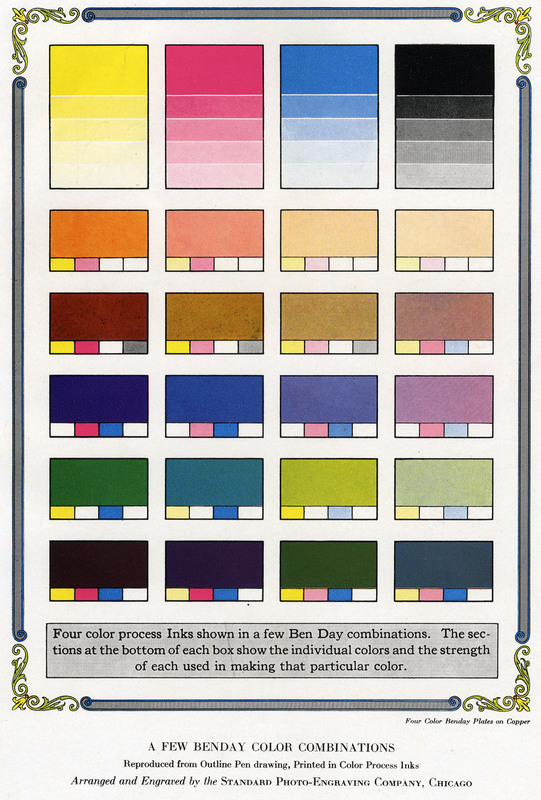 Apart from illustrating colour mixes very nicely, this chart also reveals how, by the 1920s, Ben Day tints had escaped from the newsprint world and into glossy illustration—including advertising. This was another very successful arena for our favourite dots. Original image size 16 x 24 cm, 6.5 x 9.5 inches. The chart was probably made with real Ben Day, actual size. At the top, the ad shows the four solid colours and four tint gradations of each one—perhaps 75%, 50%, 25% and 10%, I don’t know exactly—see close-ups of blue and black boxes below. 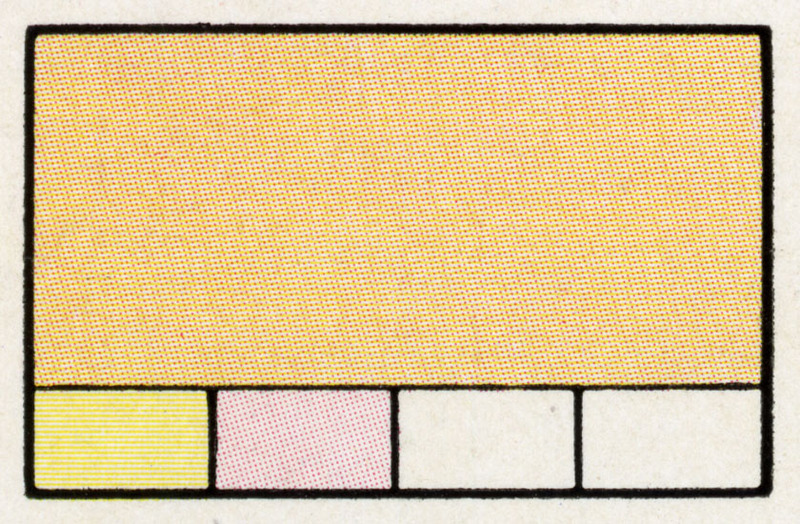 In the standardized comic book printing of the 1940s to the 1970s, only three percentages of each colour could be used—approximately 100%, 50% and 25%—solid colour, a middle tint and a pale tint. In the early days of the Sunday comics, though engravers were limited to four colours, otherwise the rules hadn’t been written yet. Ben Day operators were in theory free to use many different patterns of dots, and any percentages they wanted. However, individual workshops would have settled into grooves of their own, using the patterns and shades they knew best. 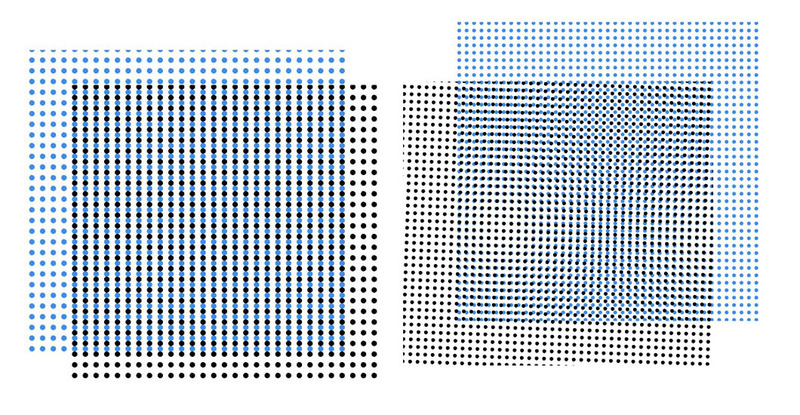 You will notice that some of the tints below are regular dot patterns and some are lines. The Standard Co. doesn’t explain why it chose these different Ben Day patterns for different percentages. Perhaps it was just to demonstrate they could do either. Here are a couple of the mixed colour boxes. The lower row on each one shows the two tints which have been mixed to make the main colour. DID THE EARLY SUNDAY FUNNIES USE BEN DAY FROM THE START? The short answer is: probably yes. But… after months of searching, I still can’t tell you when and where the first Ben Day dot was applied to a metal printing plate for letterpress printing. 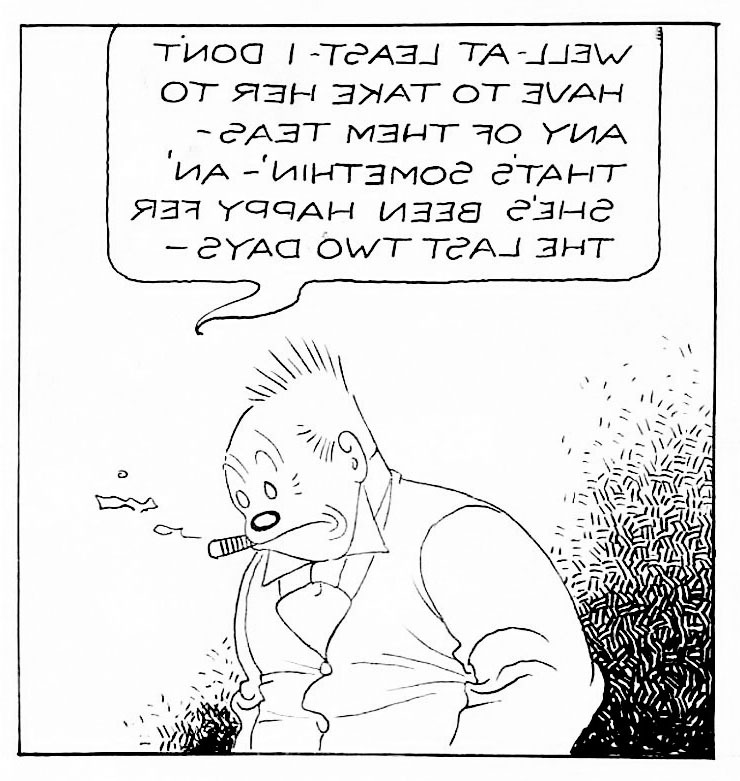 And I can’t say for sure that the first Sunday comics used Ben Day. The aesthetic, creative, publishing and social histories of comics have been studied quite exhaustively over the past few decades. Technical aspects—like printing and colour separation—are less well documented. This is despite the fact that the dots and lines used to print the comics are widely seen as part of their aesthetic appeal. 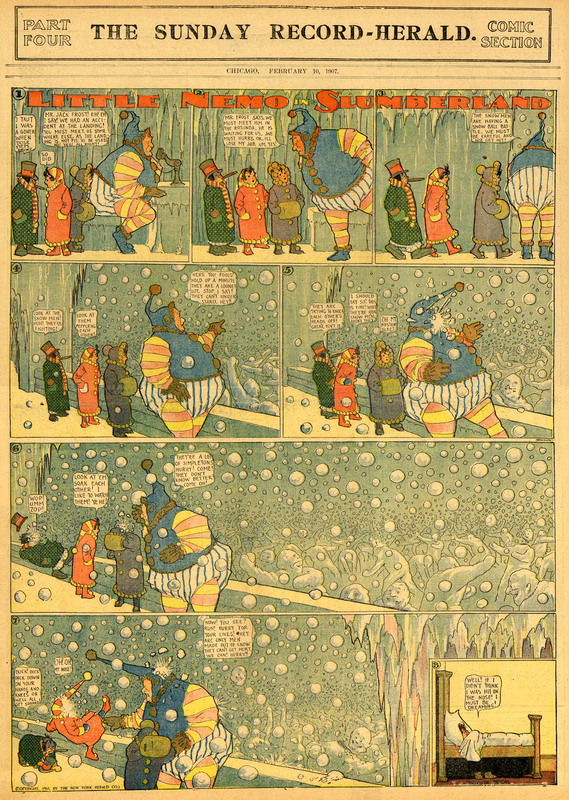 It is occasionally assumed, if rarely mentioned, that the earliest New York Sunday colour sections—and therefore the earliest Sunday colour comics, in about 1894—were printed with Ben Day dots. Until high resolution scans or close-up photos of these early pages are published, this must be regarded as unproven. Other colouring methods, as we know, were available. 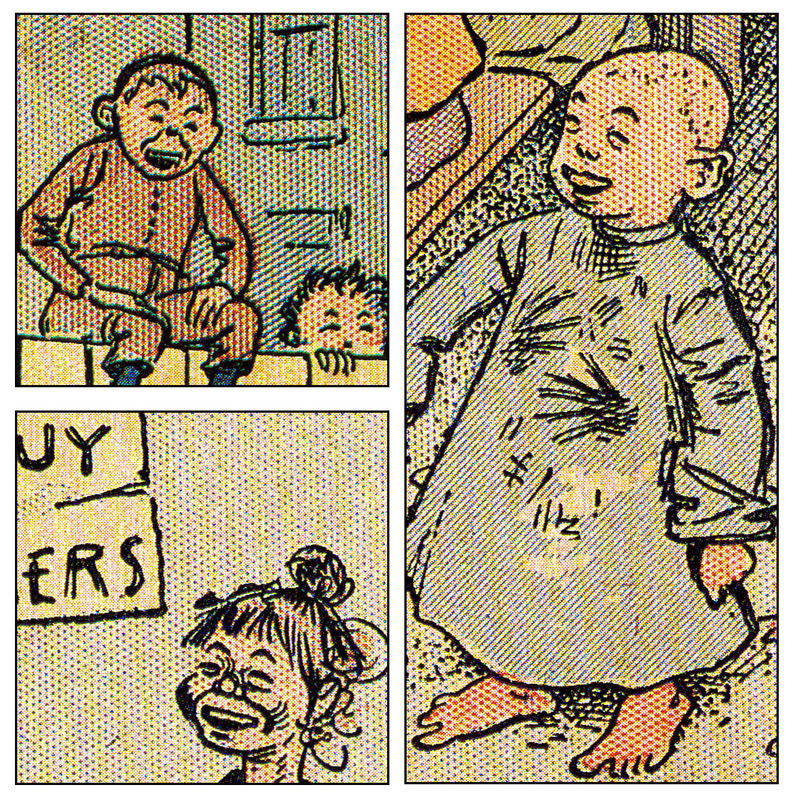 I have pages from the New York Herald, 1895, with illustrations coloured with transferred tint, others where transferred tint appears alongside Ben Day. From May 1896, I have a Herald section which uses only Ben Day. 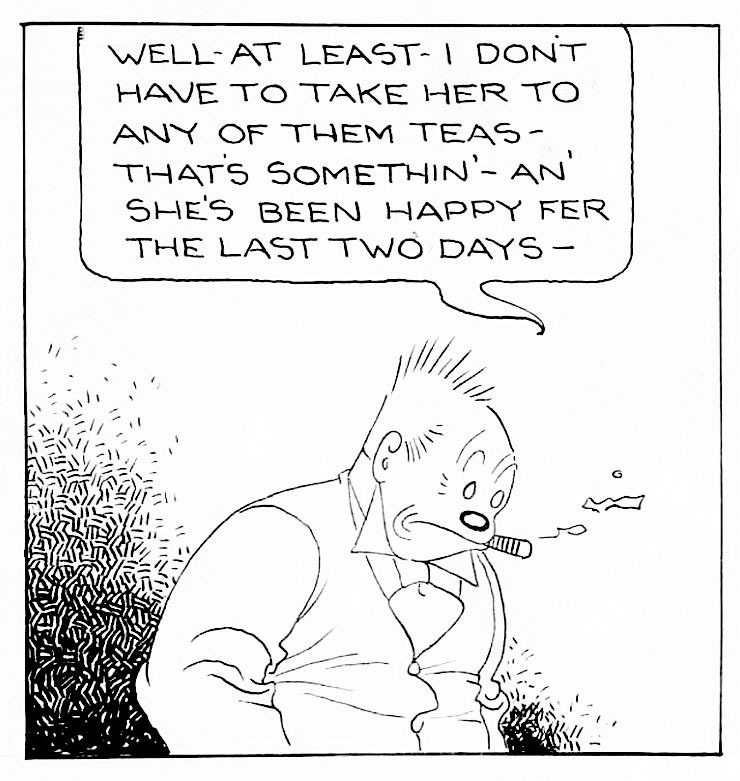 The first regular Sunday “comics” character, i.e. 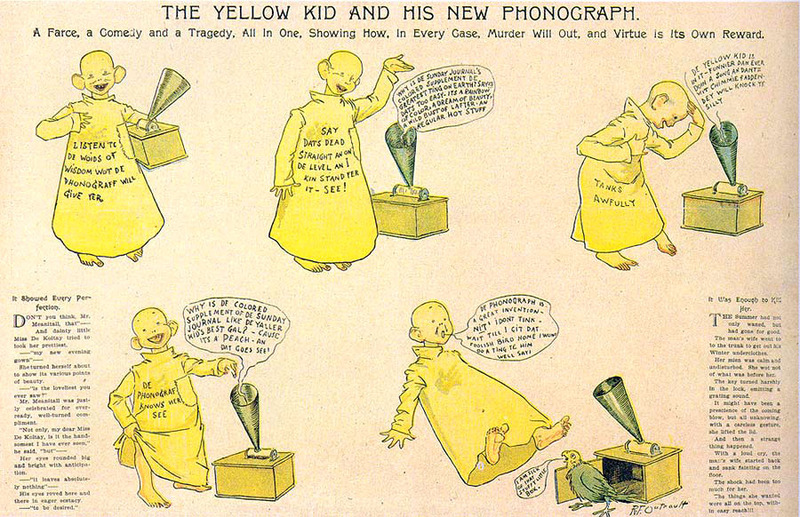 the first to appear every week, was Richard F. Outcault’s Yellow Kid. 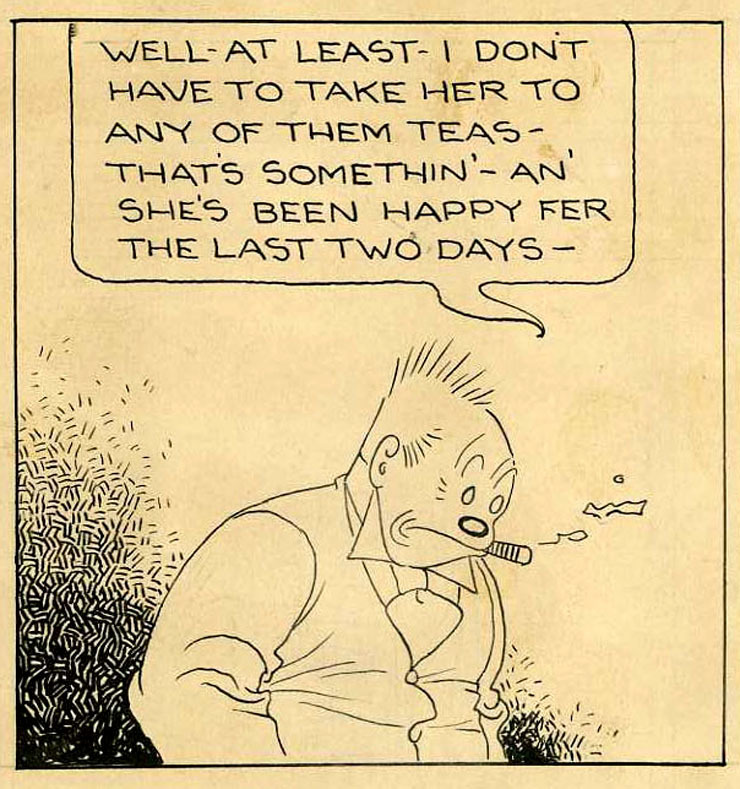 He first appeared in small single panel cartoons of Hogan’s Alley in Truth magazine (1894-5), which were reprinted in The New York World‘s Sunday section, first in B&W, then colour. 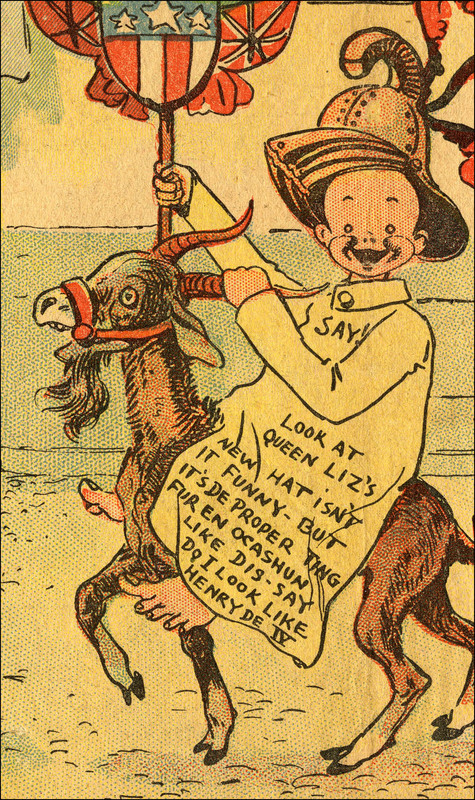 The Kid went on to star in large half or full page colour illustrations, and from October 1896, a few actual comic strips. Happily, we do know that the first appearance in colour of Hogan’s Alley, in May 1895, was coloured—at least partly—by Ben Day tints. (There had been earlier Sunday comic strips in colour, and this of course is not actually a comic strip itself, but a single-panel cartoon.) Bill Blackbeard’s splendid Centennial Celebration book of the Yellow Kid, 1995, has a large enough reprint of this cartoon that the dots and lines are visible—especially in the 1-inch wide details below. 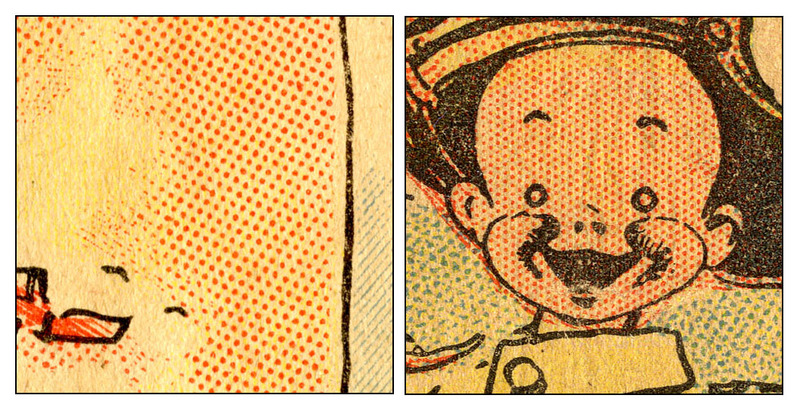 As these are scans from a photograph printed in a book, small halftone dots are visible as well as the original Ben Day dots and lines. The picture goes across the book’s gutter. Of course, we know that there had been many comic strips before this, but this is not the time to get into that subject. Looking closely at Blackbeard’s book, I am fairly certain that these New York Journal Yellow Kids were also coloured with Ben Day. 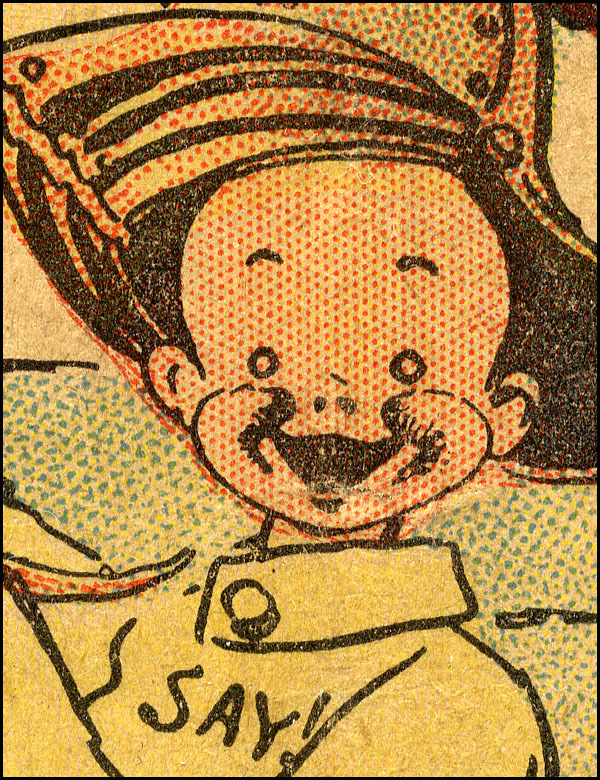 My own earliest Yellow Kid is from 1897. It isn’t by Outcault and it isn’t from the Journal. 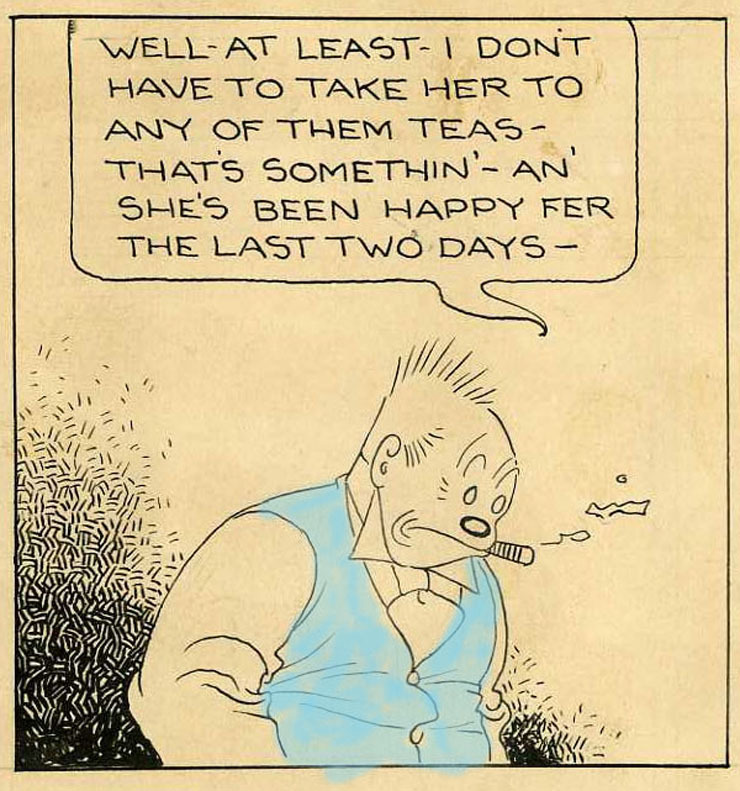 It’s by George Luks, who was hired by The New York World to continue Hogan’s Alley with the Yellow Kid, where it ran for about a year alongside Outcault’s own Journal version. The Hogan’s Alley / Yellow Kid cartoon takes up half of a full broadsheet page. Original image size: 41.5 x 25 cm, 16.5 x 10 inches approx. Also, it’s fairly clear from the image above that the World is not using a CMYK palette. Yes, it’s 4-colour printing, but the red is scarlet, not magenta. This seems to have been typical of the early Sundays. Here is a reminder for anyone who has forgotten Part 3 and CMYK. 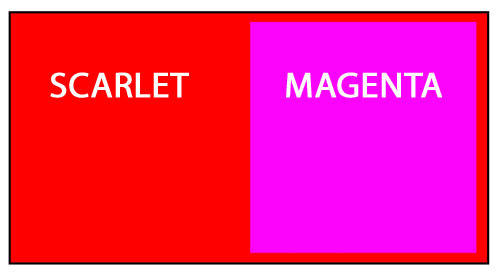 In later 4-colour comics, with their standardized CMYK printing, scarlet would be a composite colour, made by printing magenta over yellow. Next, looking at the wall on the left and the Kid’s face on the right, it is clear that at least two different patterns of regular red dots have been used. 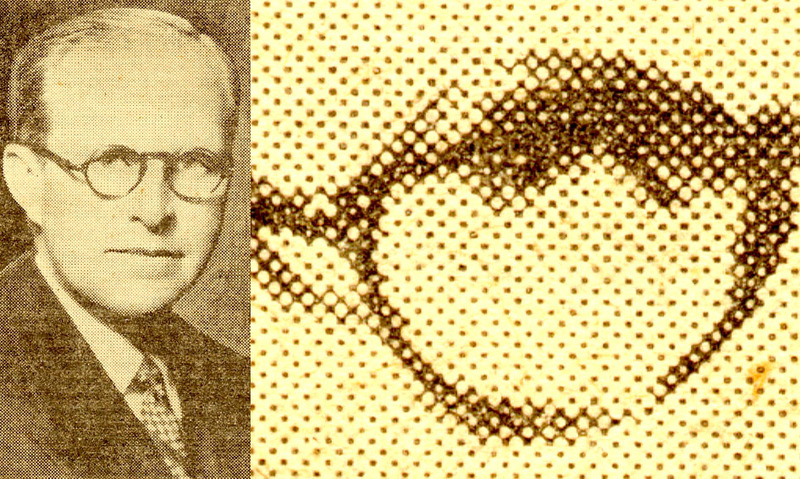 Regular grids of dots were far more rarely seen in lithography. The New York Sunday engravers seemed to have lost any former prejudice against these “unartistic”, “mechanical” dots. I think this was partly because they had been working with B&W halftone photos, with their precise dot grids, and come to appreciate them. A super-close-up on the Kid’s face, below, shows two things of interest. Firstly, he has been given yellow dots as well as scarlet, to make his flesh tone more orangey. Secondly, the Kid’s Ben Day pattern is different from the standardised 1960s comic book dots, which were in a square grid—i.e. one line of dots can be always be seen at 90 degrees to the other—see the Girls’ Romances panel in the Introduction, and the second picture below. The pattern we see here is called “60-degree offset.” You can see vertical lines of dots but no horizontals. One direction of dots is in fact at 60 degrees to the vertical, and another at a further 60 from that one. You will see no squares of dots in this grid, but hexagons and equilateral triangles. 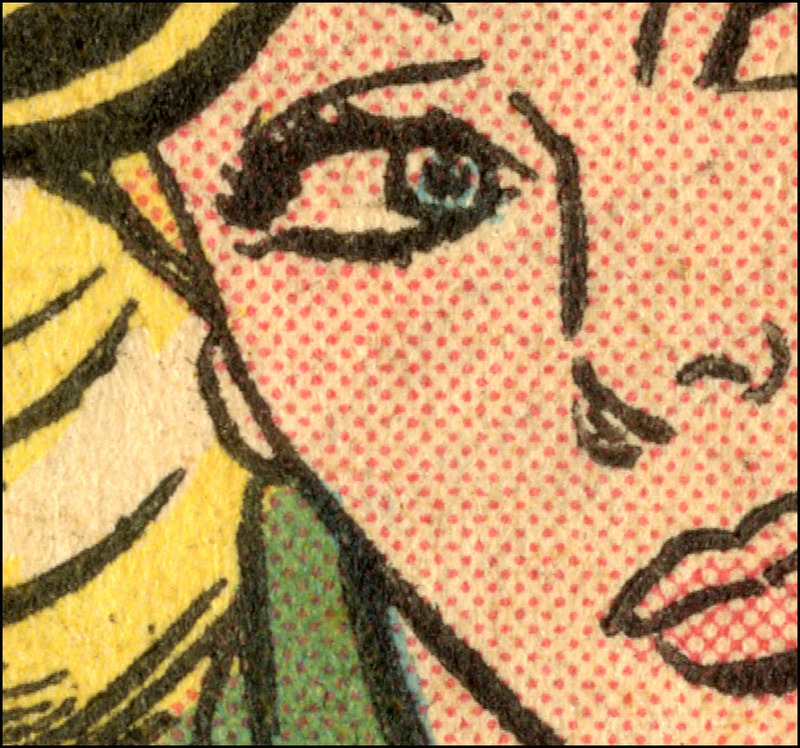 Compare and contrast: below left is the standard 1964 DC comics magenta-dotted skin tone, rotated to show the square grid more clearly. On the right is a detail from a Roy Lichtenstein face. After a few early experiments with home-made stencils, Lichtenstein consistently painted his dots with 60-degree offset stencils, and his skin tone with scarlet. When he was “copying” a DC romance heroine or war hero, he never gave them their original skin tone, either in colour or in dot pattern. 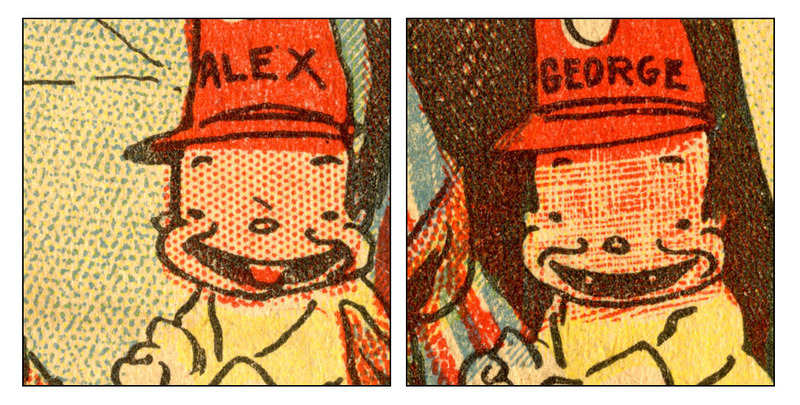 A final red-tint detail from my 1897 Yellow Kid: Below are Alex and George, the twin Scrappy-Doos of George Luks’s Kid. It appears that something went wrong with the tinting of George’s face, and it ended up too dark. The engraver has performed one of their favourite tricks on the red printing plate—using a multi-pronged graving tool to cut lines into the metal, six at a time I think. This creates white lines across the red dotted areas, lightening the tint. To some extent, this effect could be achieved at the gamboging stage—by painting on lines of gamboge which will mask the tint like this. But, from what I’ve read about engravers touching up halftone plates, I’m certain they treated Ben Dayed plates the same way. B&W halftones often lacked good white highlights, for example, which were added by scraping some dots right off the metal. And a final red-tint detail which isn’t seen in my 1897 Yellow Kid: the ruddy cheek effect. This was a favourite of the later Ben Day men—it’s a sure-fire indicator of Ben Day at work. If you’re not sure if a strip was coloured with Ben Day or by some other method, and you see ruddy cheeks like these… it’s Ben Day. To illustrate this I’ve jumped ahead to 1931 and an Ella Cinders strip (written by Bill Conselman, drawn by Charles Plumb). 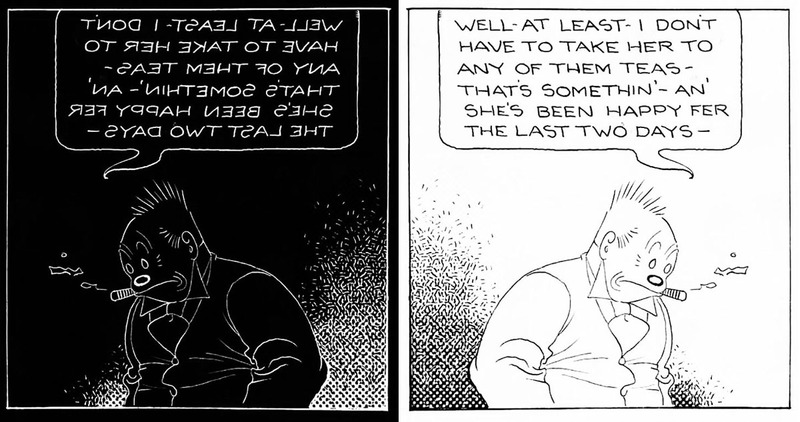 The ruddy cheeks —and the deeper tint on Ella’s shirt—are made by pressing harder on the dots for the red plate, and/or making a doubled-up tint, by applying the Ben Day screen twice. Doubling or trebling up tints is where the adjustable frame is essential, as seen in Part 5. You might also notice that Ella, in 1931, is sporting plenty of magenta, not scarlet. CMYK has arrived! 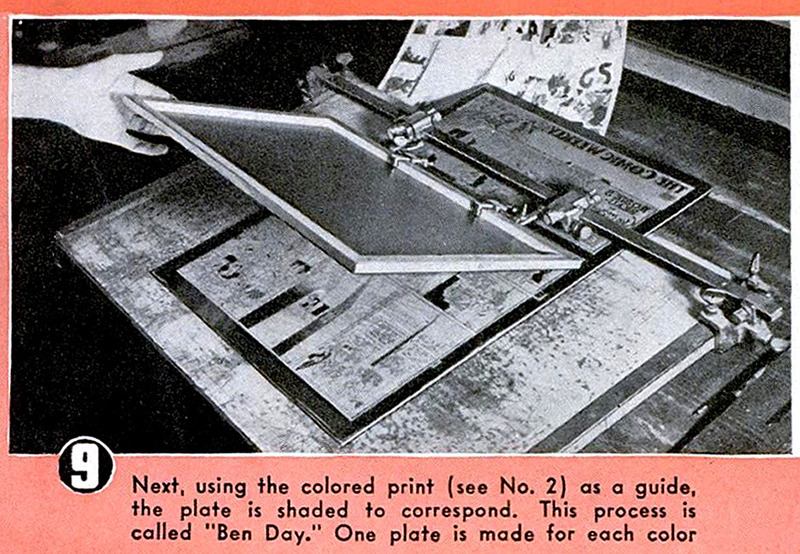 I am fairly certain that Ben Day tints were first used in letterpress—etched onto relief line blocks—before the New York Sunday sections started up. For all that I’ve said about Paris not launching the colour Ben Day revolution, I think the French did do some limited Ben Day letterpress, and I’m also hoping to find some earlier examples from Britain, the U.S.A. or elsewhere. The New York papers had tried other subjects in their colour pages before the Funnies took over—e.g. “Cosmopolitan Sketches” at the Recorder, and reproductions of famous paintings at the World—but found that their new colour printing just wasn’t up to the job. Black outlines on everything, so precise registration of colour plates was not essential—just as well, since it was rarely achieved. As the Sunday newspaper acquired glossier magazine sections, the newsprint “funnies” section persisted for over a century—and, of course, spawned its smaller descendant, the comic book, around 1933, which achieved a longevity of its own. But letterpress Ben Day did not stay confined to the Sunday newspapers. This kind of printing also provided magazine and book illustration, and the advertising industry in particular, with an affordable, widely used alternative to expensive halftone printing for decades to come. Often these images were printed on smoother whiter paper, and used much finer Ben Day tints, as we saw above. Not all comic strip artwork was crude or vulgar, though. 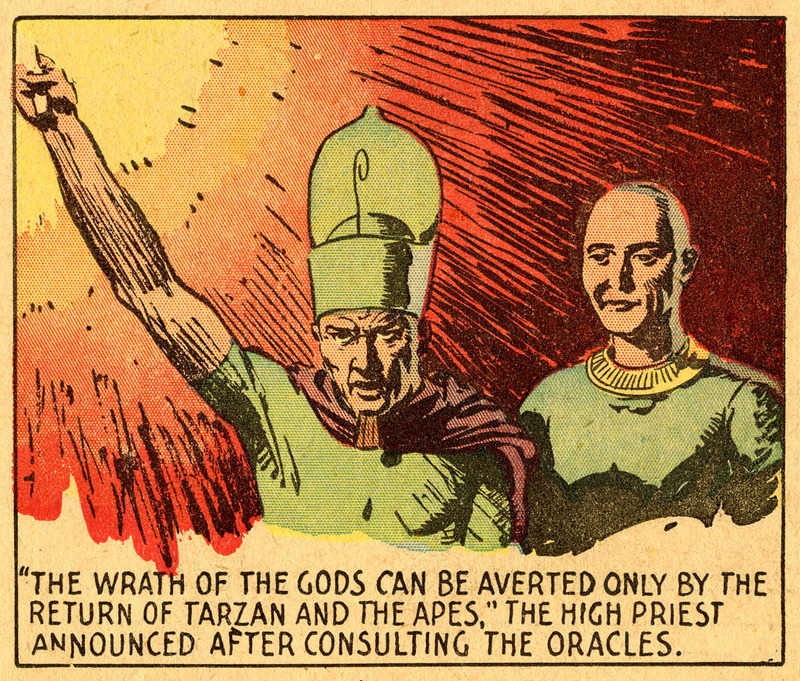 in Part 6.1, I’m looking at the Tarzan Sunday pages of the early 1930s. Here the artwork of Rex Maxon and Hal Foster gets the “Ben Day men” working very hard on their colour effects. Surprisingly, they are using just one Ben Day tint, but getting a lot of different colour values out of it. Details here. 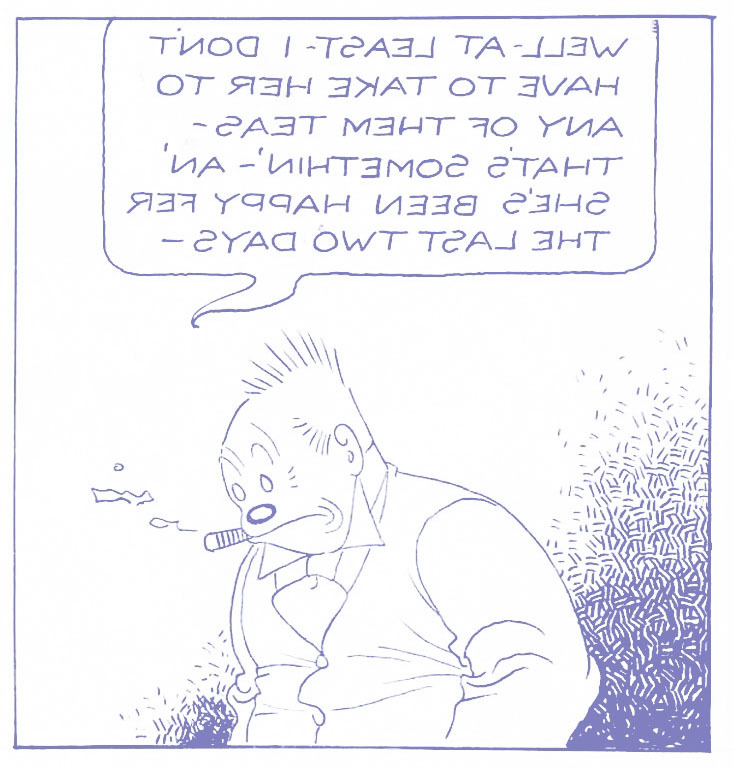 With Nemo, the American Sunday strip—and with it letterpress Ben Day—reached an early peak. This is well-documented elsewhere. I do not need to repeat the praises which have, deservedly, been heaped upon Nemo and his creator. What I would like to suggest is that, having looked at exactly how Ben Day tints were used in colour printing, you might now have a new set of tools with which to appreciate a Nemo page in a fresh way. For example, from the 1907 page below I have selected one panel, and from that, two 1-inch / 2.5 cm squares. Worth clicking to enlarge these if you can. The original is of course on a BIG broadsheet newspaper page. Image size of actual strip = 38 x 49 cm, 15 x 19.5 inches, approx. This is still a lovely page, though, and you can see the creative use of Ben Day. 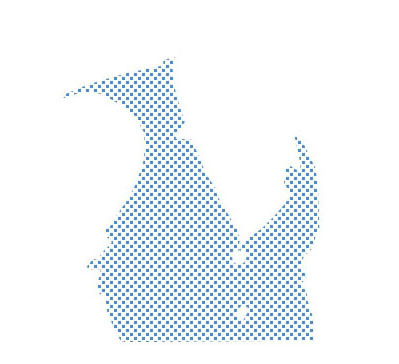 Dots have been doubled up to create darker blue areas, for example. This is a good argument for buying original old Sunday sections or “tear sheets”—pages taken from old sections—the only way to appreciate fully the colours and printing technology of these pages. 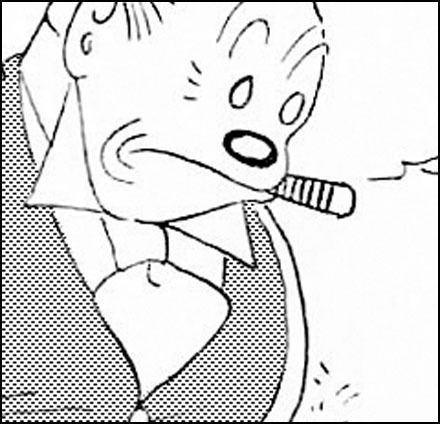 They are still reasonably affordable, though good Nemo pages may be more expensive than others. Thankfully, as you may know, there are some great reprints of old Sundays now available. 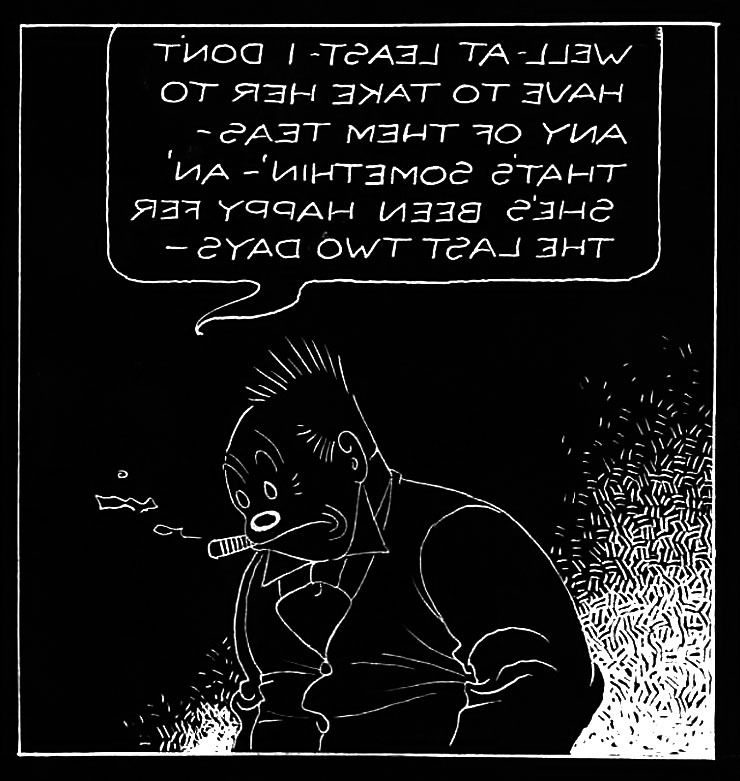 Peter Maresca’s Sunday Press books, for example, where he presents strips at their original size, with printing quality so good that you can make out the Ben Day dots and lines. 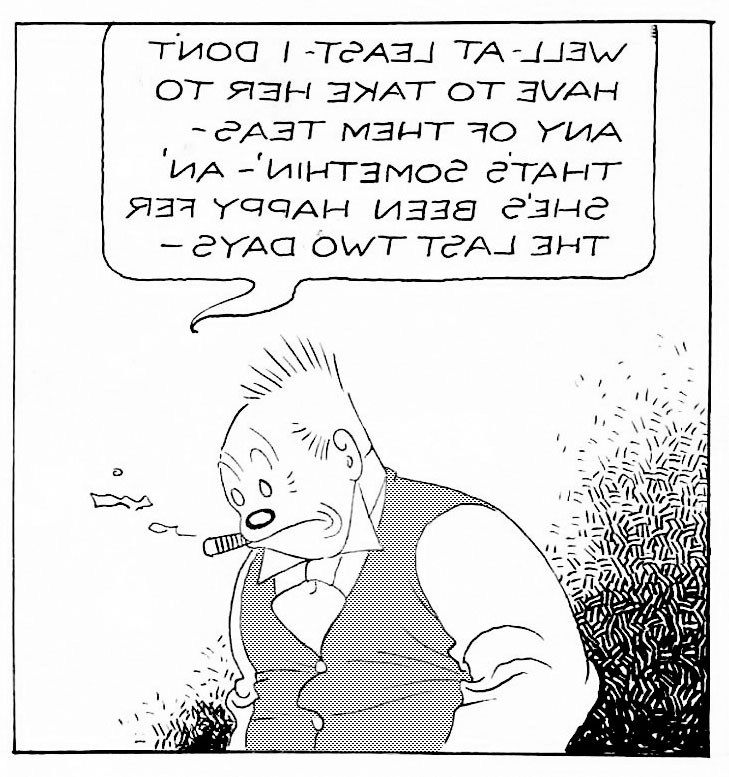 Books on Nemo and many other strips are available, and the strips are augmented by scholarly essays. Society is Nix! 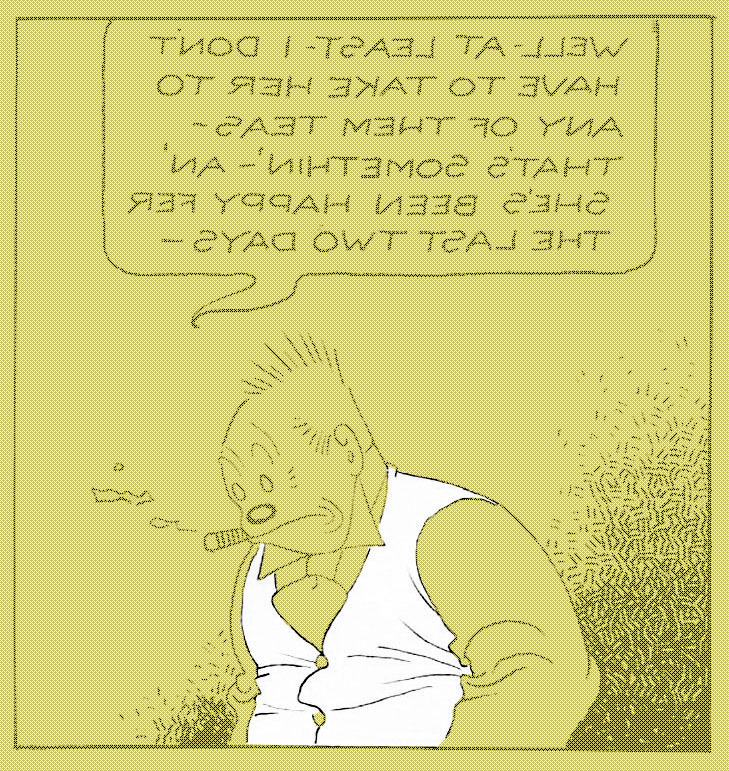 in particular presents an amazing overview of the origin years of the Sunday strips. I hope I have justified that answer in this post… and there is a lot more on this particular topic in Part 6.1. Ben Day shading is costly, takes considerable time, can be done expertly at few plants, and also takes part of the creative work of illustrating out of the hands of the original artist. These combined conditions have resulted in considerable activity to find faster methods which would give the appearance of Ben Day effects. He goes on to describe various ways artists can put tints onto their artwork directly; Craftint Duotone Board with its chemical developers, early versions of Zip-A-Tone that you cut out and stick down, etc.. 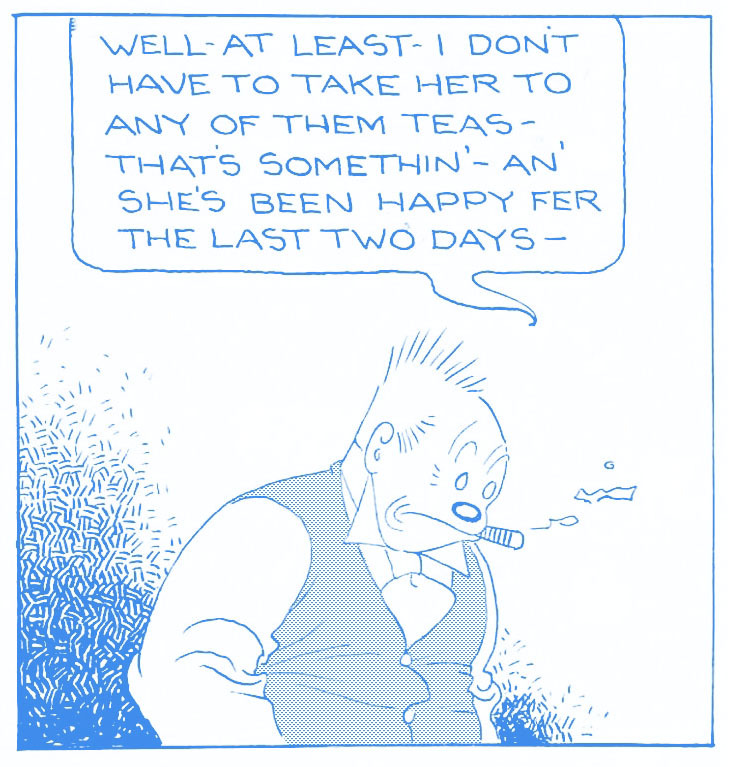 Similar thoughts went through the minds of comics publishers in the 1940s and 1950s, but they weren’t looking at ways their artists could reproduce Ben Day-like tints on their drawings. They were looking for faster, cheaper ways of getting colour tints onto their printing plates. In Part 7 I will show you what they found. Fun and surprises lie ahead! Before that, Part 6.2 will have more fun with registration, and Part 6.3 will look back at another 19th century Ben Day predecessor. Eventually, I will also come full circle, to one of the questions I asked myself at the beginning of all this: did Roy Lichtenstein really paint Ben Day dots? There shall come an answer. Possibly more than one! This entry was posted in Ben Day, Comics, History of Comics, History of Printing, Newspaper comic strips, Roy Lichtenstein and tagged Ben Day, Ben Day dots, Benday Dots, bichromatized albumen, Bringing Up Father, Charles Gillot, Charles Knight, CMYK, color separation, colour separation, Elisha Kirkall, Ella Cinders, Firmin Gillot, George Baxter, George Leighton, George McManus, George Newnes, H. H. Kohlsaat, halftone, Happy Hooligan, Hippolyte Marinoni, Hogan's Alley, Joseph Kronheim, Judge magazine, Katzenjammer Kids, letterpress, Little Nemo in Slumberland, metalcut, photoengraving, process line block, Puck, Richard F. Outcault, Roy Lichtenstein, Samuel Hodson, St Bride Foundation, Stephen Sly, Tarzan, The Graphic, The Guardian, The Illustrated London News, W.H. 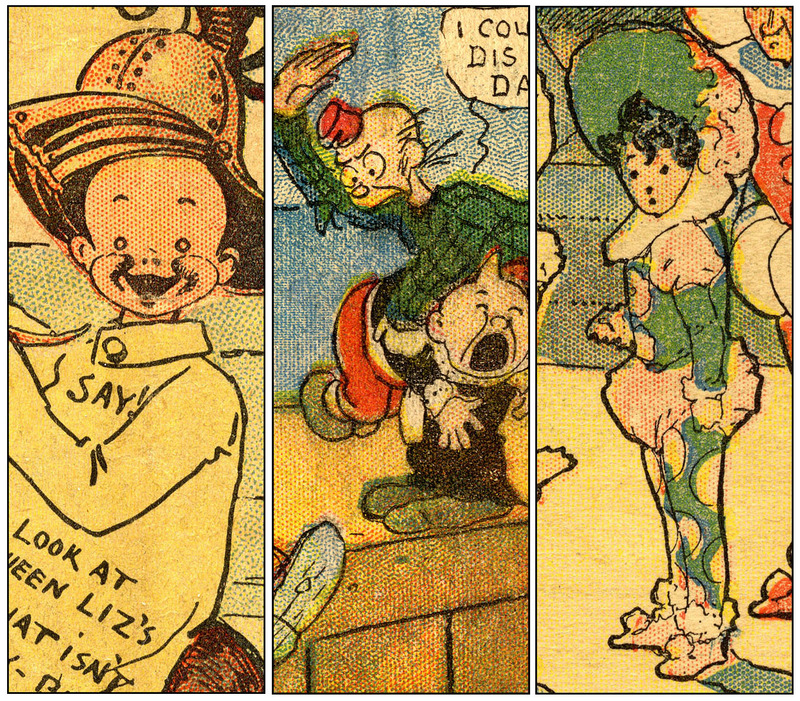 Lizars, William Blake, William Dickes, Winsor McCay, Yellow Kid. Bookmark the permalink.